The S-bend corset was fashionable during the 1900s. It thrust the hips backwards and forced the chest forward into a fashionable pouter-pigeon shape, emphasised with puffed, frilly blouses that were often embellished with decorations like lace collars and broad ribbon ties. Separates were popular, with skirts fitted over the hip and fluted towards the hem. Hair was worn in a centre parting, often looped around pads and false hair to create a wide 'brim' of hair around the hairline. This hairstyle was worn under vast, broad-brim hats with low crowns, and adorned all over with flowers, lace, ribbons and feathers. Men wore three-piece lounge suits with bowler or cloth caps. Jackets were narrow with small, high lapels. Most collars were starched and upstanding, with the corners pointing downwards. Some men wore their collars turned down, with rounded edges and modern knotted ties. Beards were now reserved for mainly older men, and most young men sported neat moustaches and short hair. The sitter in this photograph is wearing fashions typical of the 1900s. She is wearing a 'lingerie dress', a type of diaphanous gown reminiscent of nightgowns or petticoats. They were made with lots of frills and tiers, usually in white or light pastel shades, and often decorated with lace, ribbons and pin-tucks. The very early years of the century saw a vogue for light and frothy dresses, and was accompanied by hairstyles that were loose and flowing about the shoulders, often in waves. The look was one of slight undress compared to the fitted tailoring and corsetry of the Victorian age, worn especially for evening wear and for entertaining at home. Here, Baron Welby is shown in formal dress. He is wearing a frock coat, high-fastening waistcoat, starched 'winged' collar, and a top hat. Top hats were still worn by the upper classes for formal wear, though bowler hats and boaters were now common for general and casual dress. 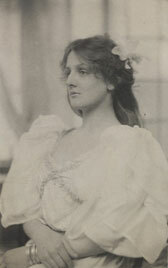 Hollyer was the photographer of choice for the artistic set of the late 19th century. His 'Portraits of Many Persons of Note' fills three volumes with nearly 200 portraits and comprises a pictorial Who's Who of late Victorian and Edwardian celebrities. 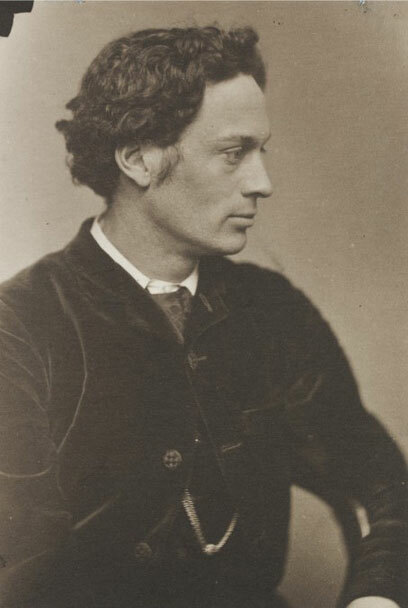 William Arthur Smith Benson was a metalwork designer and a founder-member of the Art Worker’s Guild, which gave birth to the Arts & Crafts Exhibition Society in 1886. In 1914 he helped found the Design and Industries Association, dedicated to the improvement of industrial design. 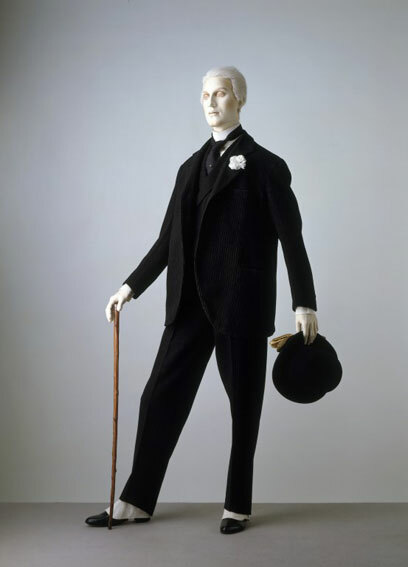 His clothes reflect his activities as a proponent of 'Artistic' dress - a late Victorian movement that encouraged looser and more naturally manufactured clothes, fabrics and dyes. His jacket is not as sharply tailored and stiff as those preferred by his more formal contemporaries, and his collar is low. 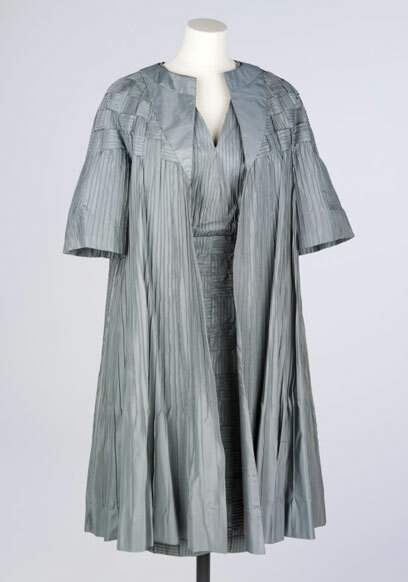 Over the years this Christening gown has gained the nickname of ‘The Bin Dress’ because an observant member of the donor’s family pulled it out of a dustbin in the early 1930s and rescued it for further use. It is unlikely that the Museum will ever know the true story of its presence in the bin: perhaps a dispute or even a tragedy, or maybe by then it was simply too old-fashioned? 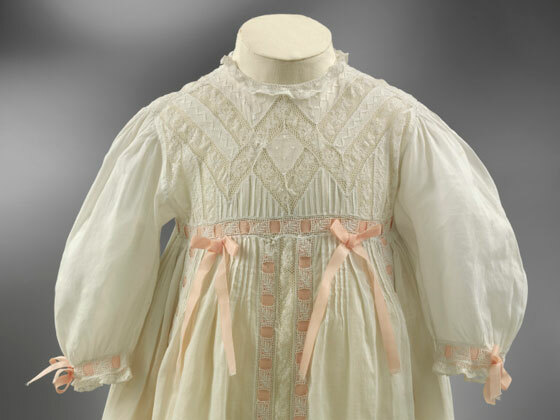 Its lace decoration is in a style that was particularly fashionable around 1900, but by the 1930s, when the dress was thrown away, the latest Christening robes were often much shorter than this and made of synthetic fabrics that were easier to iron. The sitter in this photograph is a Member of Parliament, and is shown wearing formal business dress of the 1900s. He is wearing a jacket, waistcoat, high starched 'winged' collar, and sports a fashionable curled moustache. Though male fashions did not change as rapidly as women's, his waistcoat is fastened lower on the chest than was fashionable in the 1890s. Photography was a novel and exciting development in Victorian days. Many people had studio photographs taken, in everyday dress or fancy dress, for ‘cartes de visite’, and later ‘cabinet cards’. Both were albumen prints made from glass negatives, attached to stiff card backing printed with the photographer’s name. This photograph shows the actress Henriette Henriot in stylish dress. 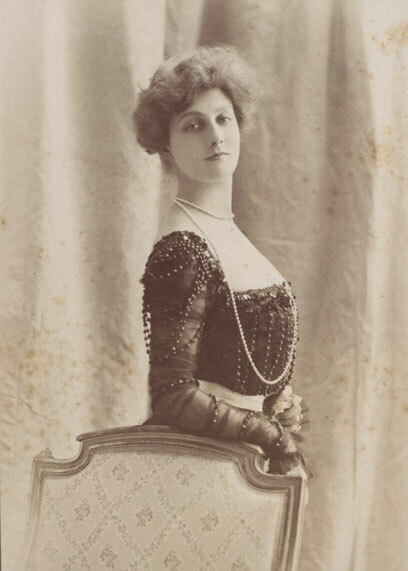 Her bosom is low and round in the shape of a puffed 'pouter pigeon', considered the height of fashion in the 1900s and especially around 1905. Her hair is piled in loose waves on top of her head, and is pushed slightly forwards over her forehead. Along with bicycling and croquet, golfing was a very popular sport with women of the 1900s. Special sporting corsets were made so that they could play with some degree of comfort, and masculine inspired fashions were created for the practicalities of time spent outdoors. 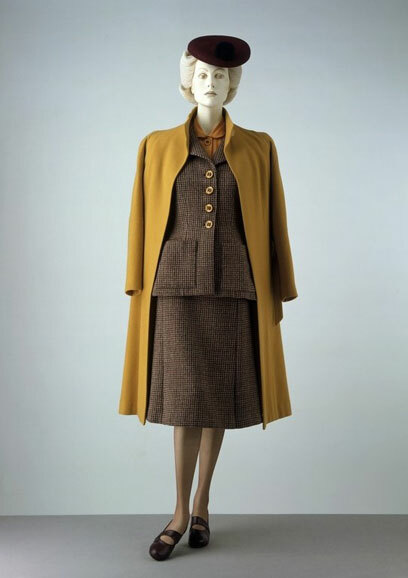 Sporting ensembles like this were created in warm, tailored tweeds, with skirts that were off the ground and not too voluminous. Crisp-looking blue and white dresses such as this were popular for boating and seaside wear. It is decorated with lace, frills and pin-tucks, to give a soft and feminine appearance. The bodice is ruched and draped to createa low, puffed chest shape that was very fashionable in the 1900s, especially around 1905. 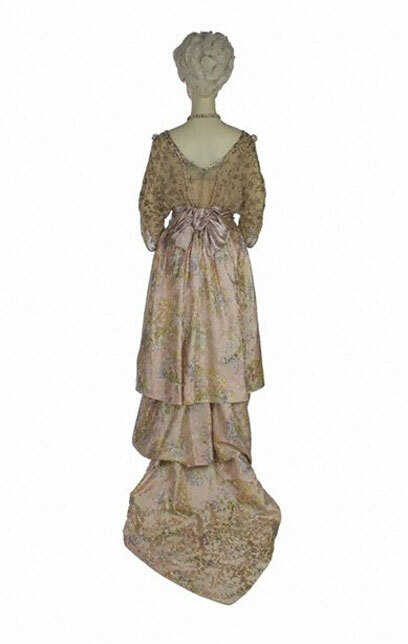 This dress was worn by Miss Heather Firbank (1888-1954), daughter of the affluent Member of Parliament Sir Thomas Firbank and sister of the novelist Ronald Firbank. Miss Firbank was young, 'had beauty, and she adorned it with exquisite clothes of a heather colour to complement her name', according to M. Benkovitz in 'Ronald Firbank: A Biography' (1970). This Paris couture coat reflects the influence of the European Arts and Crafts Movement. It features a medieval-style collar and is entirely covered in dramatic sprays of an English wildflower called 'Sweet Cicely' hand-embroidered in yellow and green silk, with petals of white felt. The influence of the Arts and Crafts movement is apparent in this coat, hand-embroidered with sprays of an English wildflower called 'Sweet Cicely' (Myrrhis odorata). In the 1880s William Morris and other English artists rejected the dominance of the machine in British art and design. Their attempts to preserve the traditional designs and craftsmanship of textiles, furniture, ceramics and architecture created the Arts and Crafts style. Wild flowers were popular motifs, evoking the simplicity and charm of English country life, now vanishing in the face of urbanisation and the industrial revolution. Echoing these concerns, ‘Aesthetic’ dress of the 1870s rejected the fussy and upholstered look of women’s fashion. Although at first ridiculed, many of the decorative features of ‘Aesthetic’ dress were absorbed into mainstream fashion by the 1890s. Marshall and Snelgrove were one of London’s exclusive department stores, founded in 1837 by James Marshall who was succeeded by his son in partnership with John Snelgrove in 1871. Bespoke dressmaking was an important feature of their store on Oxford Street and the coat combines the fashionable high collar and full sleeves with the artistic design of the embroidery. Driving Coat, Hammond &amp; Co. Ltd. 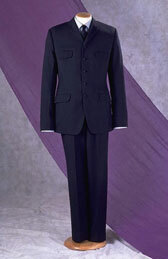 This suit has two slanting hip pockets with flaps and a small ticket pocket at the waist seam on the right-hand side. A tailor's label, stitched to the right inside breast pocket, is inscribed with the words, 'Hammond & Co., Ltd., 465 Oxford Street., London Fo 501 Mons. Paul Cocteau'. Paul Cocteau was the brother of the French writer and film maker Jean Cocteau. He preferred to purchase his sporting dress in England as he considered it to be the best quality. Queen Victoria's prolonged mourning for her husband, Prince Albert, made the practice of wearing mourning dress a social norm. Women wore full black mourning garb for one year after losing a husband or close family member, and less strict versions for a further year. 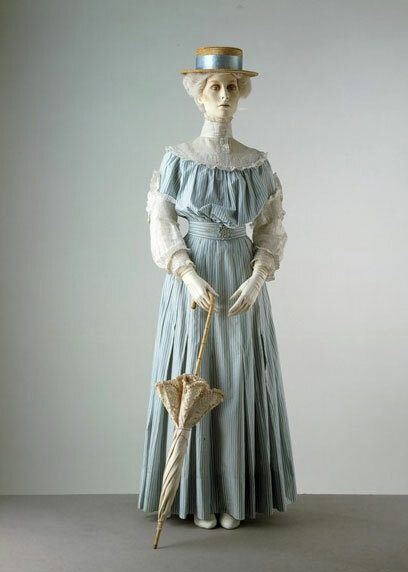 Elderly widows often stayed in mourning attire for the rest of their own lives. The practice came to an end around the time of the First World War. 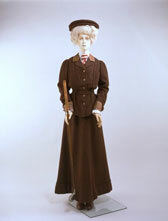 The skirt seen here is A-line in shape, typical of the early 1900s. It is trimmed with chevrons of mourning crepe. Light-coloured suits such as this became popular in the 1890s. The matching coat, trousers and waistcoat in pin-striped flannel (known as 'dittos') were accepted dress for summer sports and holidays. The outfit was often completed with a straw boater. The striped jacket had originally been worn for cricket, tennis and rowing and it became fashionable for seaside wear during the 1880s. The cut of this jacket is derived from the earlier 'reefer' coat, usually worn for sailing. The infiltration of sporting dress into informal styles of clothing shows how social conventions were relaxing in the late 19th century. Vests and pants were worn next to the skin, under the shirt or trousers. Throughout the 19th century drawers had been worn, made of similar materials to the vest, including stockinette, cotton and wool; but by the end of the 19th century the distinction between drawers and underpants was recognised. Pants were either ankle-length to the mid-calf, drawers were either just below or just above the knee. Some underpants were knee-length, to go under clothes for sporting wear: short pants of absorbent stockinette, for example, were worn for cycling. The loop of tape outside the waistband through which tongues of the braces were passed became general towards the end of the period. Many men preferred to have the vest and pants combined in one. These were known as combinations and became very popular in the 20th century. 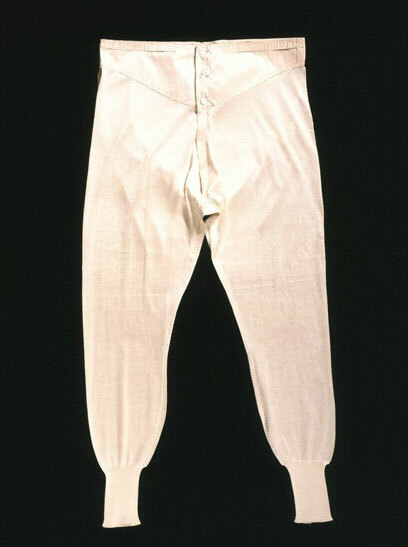 Underpants were made in linen, cotton and merino, but machine-knitted silk was fashionable with the wealthy and also for summer wear. Underpants of natural coloured wool or cellular cotton were also popular as these fabrics allowed the skin to breathe. Such materials were seen by dress reformers as the healthy alternative to silk, which they claimed trapped harmful chemicals close to the skin. By the late 19th century vests were available in a range of colours, including peach, flesh tint, lavender, light blue and heliotrope. A typical gentleman probably owned several sets of vests and underpants. They were often initialled with the name of the owner so they could be recognised during the laundry process. By 1906 the vast majority of men dispensed with underwear altogether in the summer months. The dress is dominated by the boldly embroidered panels imported from Turkey and made up in London. 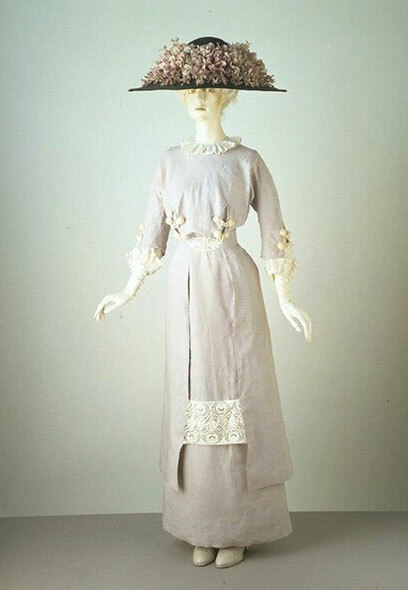 In style this dress is transitional between the pronounced curved shapes of the early 1900s and the straighter lines (with high waists) that had become current by about 1909. 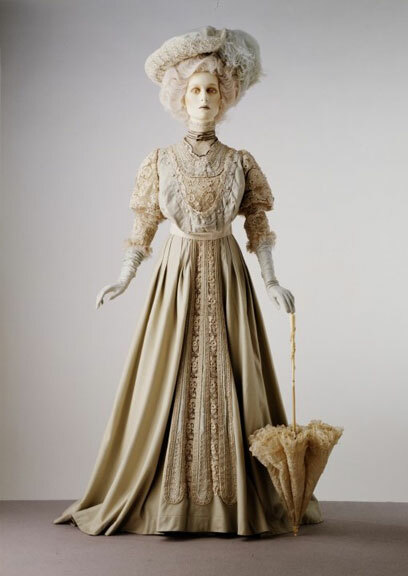 There is some evidence that an earlier dress may have been adapted to suit the tastes of 1908. The inside of the bodice has a grosgrain waist stay (grosgrain is a heavily ribbed silk) with the woven label of Jays Ltd, which bears a taffeta ribbon marked 'Lady Pearson', the name of the wearer. In the early 19th century the top hat was the predominant type of headwear in a gentleman's wardrobe. It reached its peak of popularity during the 1840s and 1850s, when mass manufacturing and industrialisation brought fashionable dress within the reach of a much wider section of the population. During the second half of the century new informal styles, such as the straw boater and soft felt hat, as well as the more formal bowler hat, challenged the predominance of the top hat. 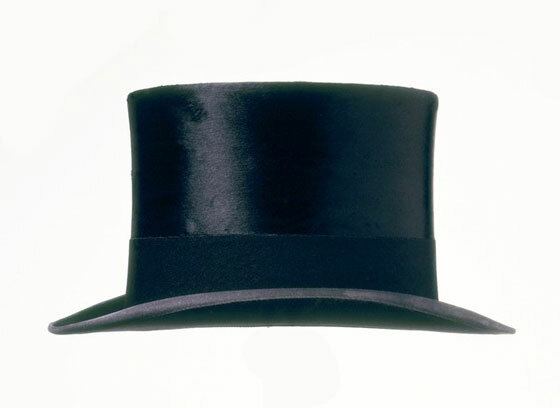 The shape of the top hat appeared at the end of the 18th century. It changed in shape over time and a range of different styles appeared as the century progressed. 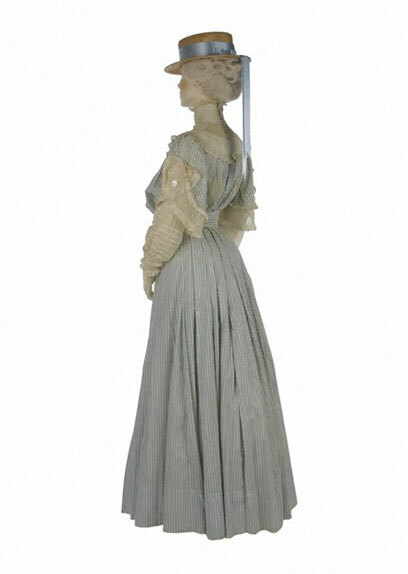 The gibus or collapsible top hat came into fashion in the 1840s and was often worn with evening dress. It was made of corded silk or cloth over a metal framework which sprung open with a flick of the wrist. It could easily be carried under the arm, making it more convenient for an evening at the opera or theatre than the rigid top hats. Some top hats had ventilation holes in the crown. In the late 18th century and first half of the 19th century top hats were known as 'beavers'. This is because they were made of felted beaver fur wool. In 1862 Henry Mayhew's London Labour and the London Poor reported that 'the bodies of beaver hats are made of a firm felt wrought up of fine wool, rabbit's hair etc. ... over this is placed the nap prepared from the hair of the beaver.' The processes used to create the beaver hats involved the use of mercury. Contact with mercury often had detrimental effects on the hatters and led to the phrase 'mad as a hatter'. By the late 19th century most top hats were made of silk. This elegant evening dress was designed by the famous Paris fashion house Maison Laferrière, located at 28 rue Taitbout in Paris. Maison Laferrière was frequented by aristocrats and others of great wealth, who admired its exquisite designs and fine workmanship. This dress was worn by Princess Alexandra of Denmark (the future Queen Alexandra), who was considered to dress with exemplary taste. It is an example of the highest standards of design and dressmaking, utilising the most luxurious materials. Though most women would not have been able to afford a dress from a couture house, many would emulate the Princess' style. This dress is typical of very early 1900s eveningwear. The torso is moulded by a rigid whalebone corset into an hourglass shape with a straight, flat abdomen. The dress exposes the décolletage, shoulders and arms, and the long skirt is fitted around the hips and fluted towards the hem. The Norfolk jacket was a versatile garment which became an important item in a gentleman's wardrobe. It was originally worn by the Rifle Corps in the Volunteer Movement of 1859-1860 and was adapted for shooting costume during the 1860s. 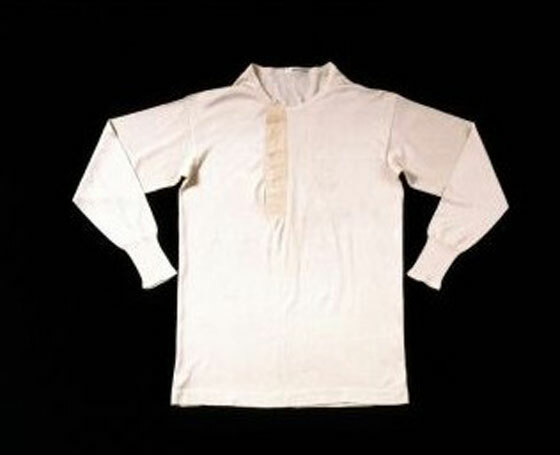 It was initially known as the 'Norfolk shirt' and was at first strictly reserved for country wear. This example was probably worn for general country wear. Inside one of the pockets are a piece of paper giving the monthly rainfall for the year 1900, a stamp, metal pin and a piece of string. By the 1890s conventions had become so relaxed that smart young men were seen wearing Norfolk jackets even in the city. Vests became fashionable during the 1840s and were often described as 'undershirts'. Men had previously worn under-waistcoats for extra warmth. Vests and pants were worn next to the skin under the shirt or trousers. By 1894 a range of styles was available, including ventilated waistcoats of lambswool with perforations under the arms, silk undershirts and vests made of lambswool. Many men preferred to have the vest and pants combined in one. These were known as combinations and became very popular in the 20th century. Vests were made in linen, cotton and merino, but machine-knitted silk was fashionable with the wealthy and also for summer wear. Undervests of natural coloured wool or cellular cotton were also popular, as these fabrics allowed the skin to breathe. Such materials were seen by dress reformers as the healthy alternative to silk, which they claimed trapped harmful chemicals close to the skin. By the late 19th century vests were available in a range of colours, including peach, flesh tint, lavender, light blue and heliotrope. 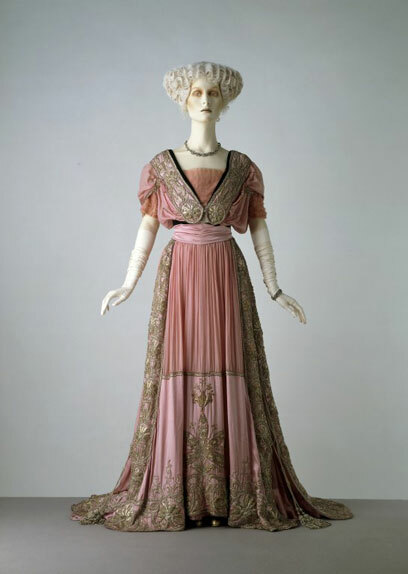 This dress is typical of very early 1900s eveningwear. The torso is moulded by a rigid whalebone corset into an hourglass shape with a straight, flat abdomen. The dress exposes the décolletage and shoulders, and the long skirt is fitted around the hips and fluted towards the hem. There is a train, but no bustle. It was made by Charles Frederick Worth (1825-1895), a celebrated Parisian couture dressmaker. He was born in Bourne, Lincolnshire, and started working at the age of 12 in a draper's shop in London. Eight years later he moved to Paris, where he opened his own fashion house in 1858. He was soon patronised by the Empress Eugenie and her influence was instrumental to his success. His clothes, admired for their elegance and fine workmanship, became an important symbol of social and financial advancement. 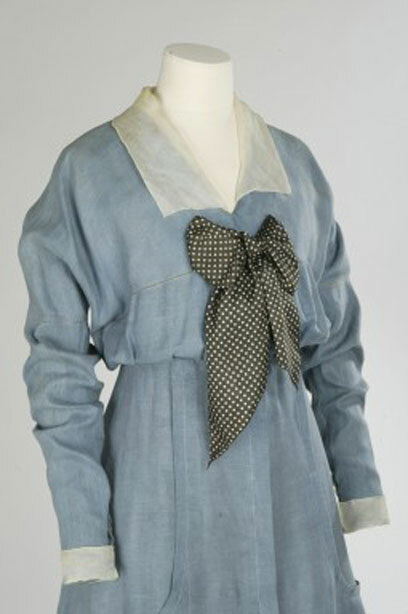 Crisp-looking blue and white dresses such as this were popular for boating and seaside wear. It is decorated with lace, frills and pin-tucks, to give a soft and feminine appearance. The bodice is ruched and draped to create a low, puffed chest shape that was very fashionable in the 1900s, especially around 1905. Pastel colours combined with cream were greatly favoured by fashionable Edwardians. This costume shows how designers of the period lavishly adorned plain cloth with a variety of rich trimmings. It has an alternative matching jacket, a pair of white kid shoes trimmed with ribbon, and white silk stockings, which are not shown in the image. 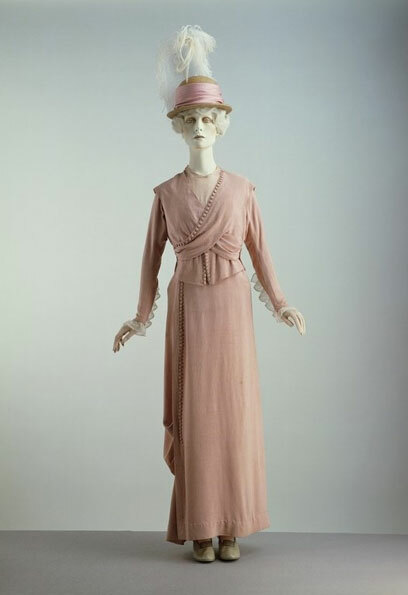 The ensemble was worn by Viscountess Brackley, née Miss Violet Lambton, who became the Countess of Ellesmere (1880-1976). She married Viscount Ellesmere in the autumn of 1905 in St Margaret's Church, Westminster, London. This society wedding was recorded in The Queen, The Lady's Newspaper on 4 November 1905: 'the bride travelled in a blue cloth costume trimmed with Irish lace and braid and a hat to match'. This report was accompanied by a sketch showing the wedding-gown, travelling costume and bridesmaids' dresses. The smoking jacket was a short, easy- fitting coat, cut in the style of a lounge jacket. It was a distinctive garment since it was often quilted and decorated with silk cord or braid frogging. It could be single- or double-breasted. Soft materials were used such as silk, velvet or wool in dark reds, greens, blues, brown or black. This smoking jacket and matching trousers appear to have been made out of handkerchief silk as the pattern is not continuous. The fabric was probably made in India for the European market. The popularity of the smoking suit shows how sartorial rules were relaxing in the late 19th century. The smoking jacket was often worn in place of the dinner jacket for an informal evening at home. It was worn with day trousers, evening trousers and sometimes (as in this example) with matching easy-cut trousers. The trousers on this suit are adjusted with a buckle at the back, but trousers could also be secured by a girdle at the waist like pyjama trousers. The smoking jacket was still popular in the early 20th century. 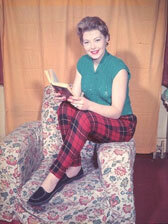 In 1956 the Austin Reed catalogue announced an updated version of the smoking jacket, named the television jacket. This did not become a widespread fashion as by this date few men felt the need to wear a special garment for watching television or smoking. During this decade, frilly, puffed blouses and fluted skirts continued to be popular. A slightly high waistline was fashionable, as was a long tunic-like top worn over an ankle length A-line or 'hobble' skirt (cinched in at the hem). During World War I (1914–18), women adopted practical, working clothes and they sometimes wore uniform, overalls and trousers. Hair was worn in a centre parting, often looped around pads and false hair to create a wide 'brim' of hair around the hairline. This hairstyle was worn under vast, broad hats with shallow crowns, heavily trimmed with flowers, ribbons and feathers. Towards the end of the decade, younger women sported short bobs. The three-piece lounge suit was commonly worn, but from 1914 to the end of the decade, many men were photographed in military uniform. Hair was worn parted at the side or the middle. Older men sported beards, but younger men wore moustaches or went clean-shaven. Hats reached an immense size in the early 20th century. 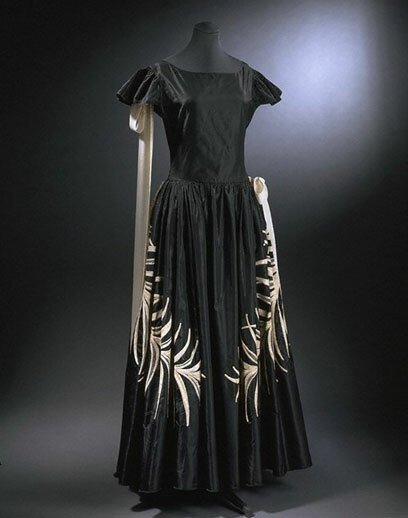 This very fashionable example from 1910 is made of a fine black straw. It has an outsize crown, which would have been supported by the piled-up hairstyles of the time. Long hat-pins would have secured the hat to the hair. Hats were often lavishly trimmed, and with its mass of purple cotton artificial flowers, this is no exception. A scene such a this showing fashionably dressed women out walking with their dogs, or with friends, was a favourite subject for the photographer Lartigue. 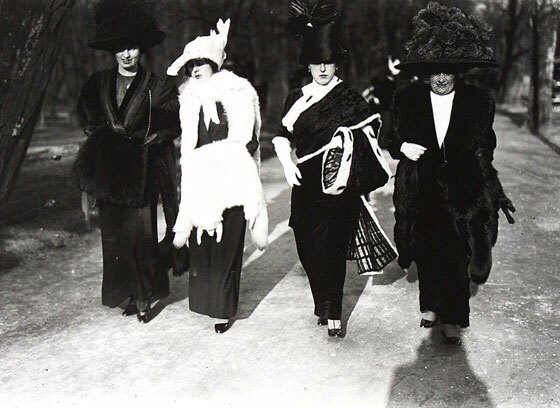 Many of his photographs from this period document high fashion - the women he chose to photograph were the wealthy and well-to-do, dressed in the latest fashions, wearing furs and extravagant hats trimmed with feathers. These women are also wearing the fashionable 'hobble' skirt - a long skirt that cinches at the lower leg and ankle. A stroll in a public park was a favourite pastime for the leisured classes, and women especially took it as an opportunity to display their wealth and taste. The house of Lucile was renowned for its asymmetrical styles, of which this matt black silk crepe dinner dress is a perfect example. Set into a high waist, the bias-cut skirt is softly swathed over the left hip and the hem is extended into a triangular train. The cross-over bodice has a plunging V neck fitted with a machine-made black lace, while bands of cream and black silk decorate the neck and cuffs. This is from the collection of Heather Firbank (1888-1954), daughter of the MP Sir Thomas Firbank and sister of the novelist Ronald Firbank. The dress is a half-mourning dress, meaning that it was worn in the later stages of mourning. 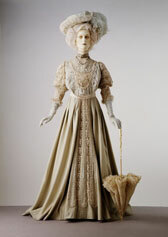 Mourning etiquette was well controlled and what could be worn at each stage was rigidly prescribed. Given by H. L. Sparks, Esq. 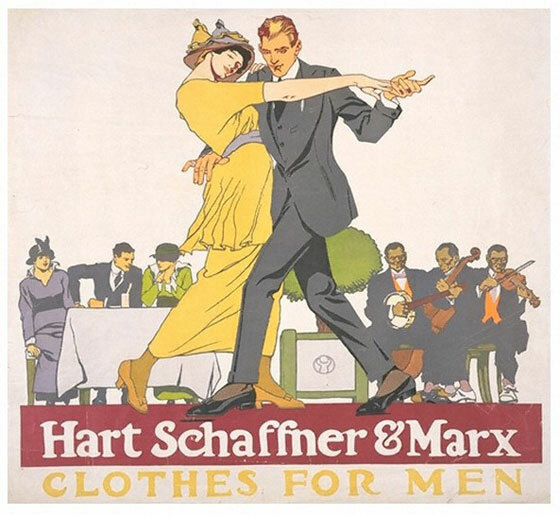 This is a poster for Hart Schaffner & Marx, who made hand-tailored clothing for men. It depicts youthful fashions. The man's suit is less formal than those of previous decades. His blazer is shorter than long Victorian frock coats, and resembles a modern 3-piece suit. His collar is not starched up, but is turned down over his tie. His dancing partner wears a dress typical of the decade - a long tunic-style top, belted at the waist over a relatively slim ankle-length skirt. This practical, less formal dress style was driven by a dance craze, particularly for the tango, that started in America in the early part of the decade and spread to Europe within a few years. 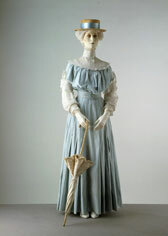 This simple 'seaside' dress formed part of Miss Heather Firbank's wardrobe. She was daughter of the affluent Member of Parliament Sir Thomas Firbank and sister of the novelist Ronald Firbank. 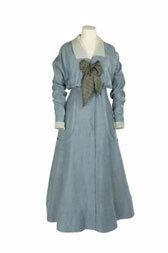 The dress has a simple collar and spotted cravat. 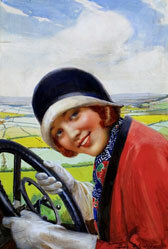 Its fresh youthful style conjures up images of summer holidays during the years before the First World War (1914-1918). Cravats and foulards were popular at the time on blouses as well as dresses. They were inspired by earlier masculine styles in neckwear. In August 1912 The Queen magazine described 'the prettiest style of Robespierre collar, finishing with a Latin Quartier cravat of blue and white birds-eye spot silk'. In 1921 Heather Firbank's clothes were packed into trunks and put into storage, where they remained for the next 35 years. 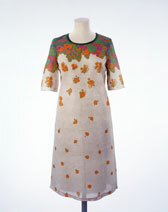 In 1960 the V&A acquired well over 100 items from her wardrobe. This collection forms an invaluable record of a stylish and wealthy woman's taste between about 1905 and 1920. 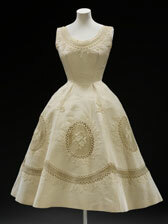 Many items were shown in an exhibition at the V&A in 1960. It was called 'Lady of Fashion: Heather Firbank and what she wore between 1908 and 1921'. 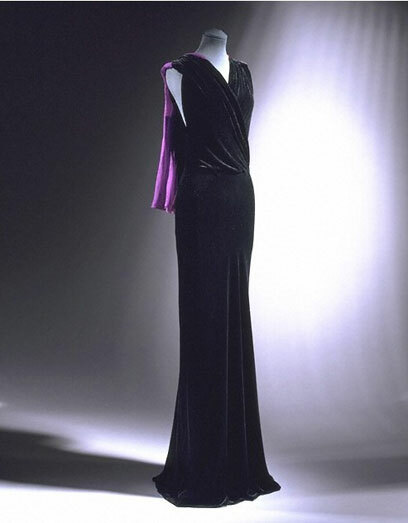 The high-waisted black cashmere kimono-like gown is trimmed with striking notes of purple and a wide draped purple sash of silk crepe. It has an unusual bodice (without centre back seam), incorporating bat-wing sleeves with long, tapered cuffs and a wired 'Tudor'-style, heart-shaped collar. The gown wraps over and fastens along the left front with tiny press-studs under a line of blind buttonholes with pendant buttons. 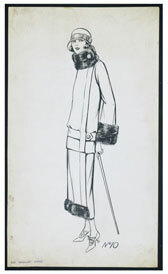 Before the outbreak of First World War in 1914, which all but smothered the market for luxury goods, couturiers created evening clothes that were complex assemblages of luxurious materials and trimmings. 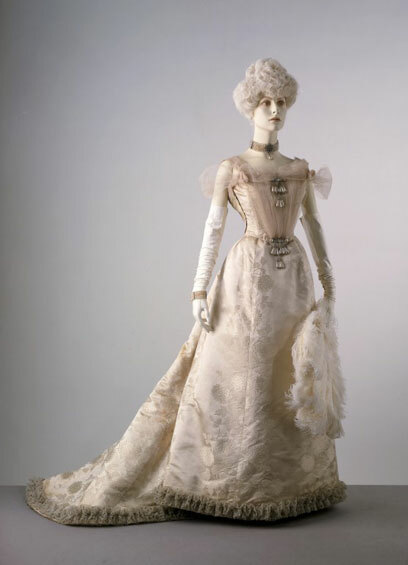 They were often, as with this evening dress, constructed with multiple layers of diaphanous fabrics trimmed with metallic threads, pearls and diamantés to catch the light. 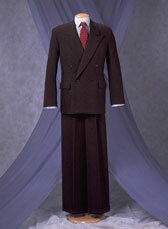 This is a typical example of a gentleman's morning suit. In the early years of the 20th century it would have been worn as everyday dress by professional and business gentlemen, as well as for formal occasions. It was said to have been worn at the donor's wedding by her father. The morning coat originated in the single-breasted tailcoat worn in the early 19th century. This was also known as the riding coat, or 'Newmarket'. By the 1850s the coat was shaped halfway between a riding coat and a frock coat. It was usually single-breasted and was known as the 'cutaway', as the fronts sloped away elegantly to the broad skirts behind. After the First World War the morning suit was gradually superseded by the lounge suit for everyday wear, though it continued to be worn by older men. 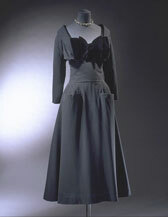 Around 1910, leading fashion houses such as Worth created evening dresses with a straight silhouette. Their impact depended on the juxtaposition of colours and a variety of luxurious and richly decorated fabrics. On this garment, vivid velvet pile is set against light-reflecting beadwork, and the triple-tiered matt net overskirt covers the sheen of the trained satin skirt. The pillar-like look exemplified by this dress replaced the exaggerated curves of the early 1900s. It also shows how designers broke the strong vertical emphasis by creating overskirts with horizontal lines. The bodice, however, is still boned (nine bones). Charles Frederick Worth (1825-1895) was a celebrated couture dressmaker in Paris. Born in England at Bourne in Lincolnshire, he started working at the age of 12 in a draper’s shop in London. After working for various haberdashers and silk mercers, he left for Paris in 1845. In 1858 he went into partnership with a Swedish businessman, Otto Bobergh, and opened his own house. He was soon patronised by the Empress Eugénie (1826-1920), wife of the French Emperor, Napoleon III, and her influence was instrumental to his success. Obtaining made-to-measure clothes from his house was a symbol of social and financial success. They were appreciated for their beauty, elegance and fine workmanship. 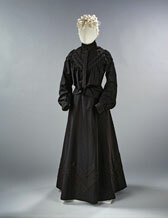 This garment reveals the fashionable elements of dress immediately before World War I (1914-1918). The line is straight and the cut (especially of the cross-over draped bodice) is intricate. Rows of non-functional tiny buttons were frequently used as decorative motifs in this period. The bodice is lined with white cotton (with ruffles attached to give fullness at the bust) and has a stiff, silk-faced waistband. It was not made by one of the top houses, for it is probably a copy by a good dressmaker of a Paris model . The construction of riding-habits is a highly specialized branch of the tailor's art. Because riding-habits are subject to considerable stress, the emphasis throughout is on firm and accurate construction. Seams that take strain and might rub are lined and reinforced with black cotton, and buttons are backed with cotton. This particular example was made for Mrs James Fraser (née Miss Grace Isabelle Spencer-Smith), the mother of the donors. John Redfern was born in England about 1819. 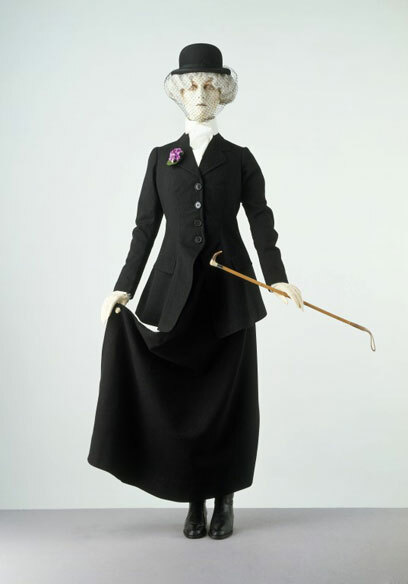 In the 1870s he began designing beautifully constructed and practical tailored garments to meet the needs of women engaging in various sports, from yachting and tennis to archery and riding. His designs were adopted by royalty, actresses and fashionable women for everyday wear as well as for sports. He opened branches in London (1881), Paris (1881), New York (1884) and Rhode Island (1885). He closed his fashion houses in 1932. They were resurrected in 1936, but closed again in 1940. 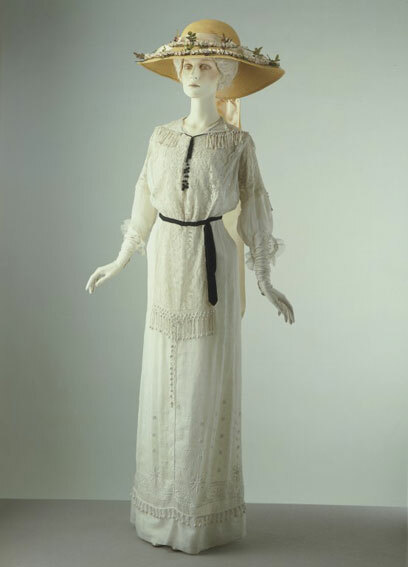 This style of delicate pale dress was immensely popular for wear at summer garden parties and fêtes. It has wide, inset panels of lacis patterned with a meandering leaf stem at the front, back and sleeve tops to complement the light fabric. An inner net bodice fastens at the centre front with a row of minute lawn-covered buttons and loops. The fashion (current between about 1909 and 1912) for enormous hats was ridiculed in the popular press. However, fashionable women (even suffragettes) continued to wear these extravagant creations. False hair pads ('transformations') were often used, and the hats were anchored with long pins stuck through the hat and the real and false hair (safety guards shielded the sharp hat-pin points). The dress was given to the Museum by the Hon. Mrs J. J. Astor and forms part of the Cecil Beaton Collection, brought together by the society photographer Sir Cecil Beaton (1904-1980). With great energy and determination, Beaton contacted the well-dressed elite of Europe and North America to help create this lasting monument to the art of dress. The Collection was exhibited in 1971, accompanied by a catalogue that detailed its enormous range. The lounge suit became popular during the 1860s because of its easy comfort. It originated from the 'lounging jacket', which was cut to fit the waist without a waist seam by means of a long dart from under the arm to the waist. By the 1870s the jacket was worn with matching waistcoat and trousers and had become popular for informal wear. 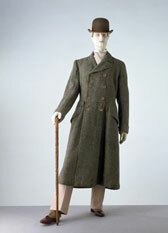 In the early 20th century it replaced the frock coat and the morning coat. 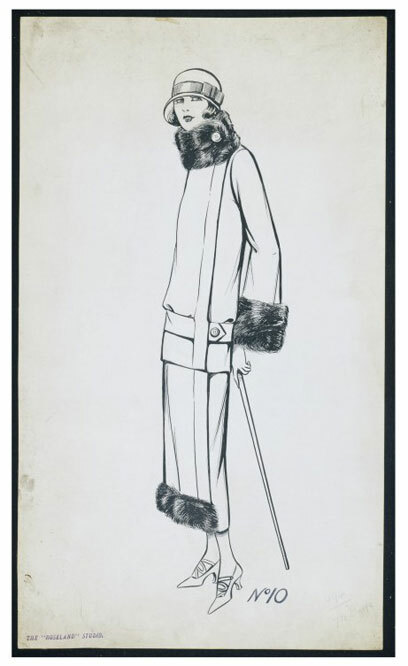 The owner of this lounge suit was Sir Max Beerbohm (1872-1956), the English essayist, caricaturist and master of a polished prose style. At the very beginning of the1920s it was fashionable for women to wear high-waisted, rather barrel-shaped outfits, and tunic-style tops were popular. However, between 1920-2 the waistline dropped to hip level, obscuring natural curves for a tubular, androgynous look. Young, very fashionable 'flappers' wore their hems at knee level, with neutral coloured stockings and colourful garters. Hemlines drifted between ankle and mid-calf for the duration of the decade. Jewellery was prominent, including large brooches and long strings of pearls. Hair was worn bobbed, sometimes close to the head, and the distinctive cloche hat (a close fitting, bell-shaped hat) was very popular. Men wore narrow-cut lounge suits, with pointed collars turned down, and plain or simply patterned modern knot ties. 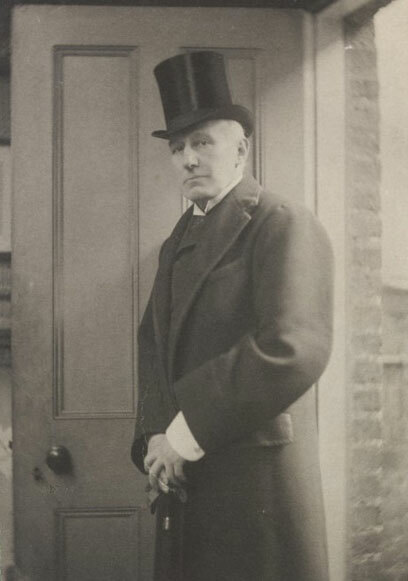 Cloth caps were popular amongst the working class, though trilbies or homburgs were worn by the middle classes. Hair was cut very short at the sides, parted severely from the centre or the side and smoothed down with oil and brilliantine, or combed back over the top of the head. This fashion plate is from the journal 'Gazette du Bon Ton'. The journal featured articles about theatre, travel and other pursuits of interest to the leisured wealthy, but the main emphasis was always on fashion. It was published from November 1912 to the summer of 1915, and again from January 1920 to December 1925. The complete run consisted of 12 volumes. It was intended for the Parisian elite, and introduced fashions in colour plates such as this one. The contributors included many prominent artists of the time, and the colour plates anticipated the Art Deco style that was to dominate the 1920s. The illustrations were stencilled by hand with watercolour, in a technique known as pochoir. It shows a man in evening dress, with tails and a top hat. It is a simple and effective image of a tall and elegant man smoking. The only splash of colour is his yellow glove. Despite the simplicity of the image, it communicates glamour. This is a design for the cover of 'Pearson's Magazine'. Henry Haley produced several cover designs for this popular publication in the 1920s. It clearly appealed to a largely female readership. Here Haley uses the image of a woman driver to represent a modern outlook and an independent lifestyle. She is wearing a fashionable cloche hat and sports a bob. This design is from the packaging company Willetts & Sons, which was based in London from 1910 until the 1960s. The company made paper bags, card boxes, labels and tickets for a range of different clothes stores. Sometimes they employed artists to illustrate these items. This example was drawn by a commercial artist at the little-known Roseland Studio in the 1920s. It shows a glamorous young woman wearing an elegant fur-trimmed suit, together with the latest cloche hat and bobbed hair. Her outfit is tubular with a drop-waist, reflecting the rather androgynous styles of the decade. Such an image was clearly designed to appeal to fashionable customers and to reflect well on the clothes store which used it. The V&A holds over 40 similar designs from Willetts & Sons. This example was drawn by a commercial artist at the little-known Roseland Studio in the 1920s. It shows a glamorous young woman wearing a fur-trimmed coat in the latest style, together with a cloche hat and bobbed hair. The coat is straight and rather tubular, with a dropped waist, reflecting the androgynous silhouette of the decade. Such an image was clearly designed to appeal to fashionable customers and to reflect well on the clothes store which used it. 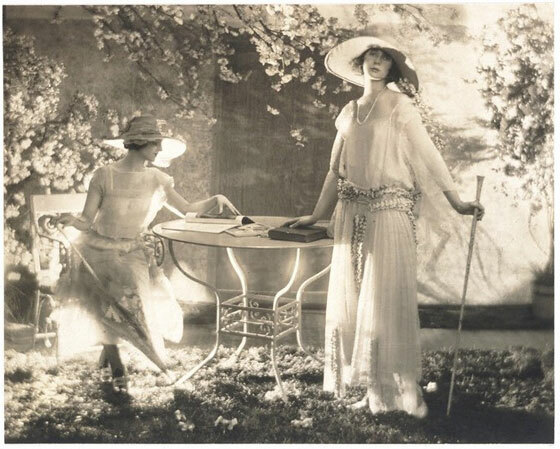 This fashion study shows two models at a garden table, sporting wide brimmed summer hats over fashionable bobbed hair. Their dresses featured dropped waists and a straight silhouette, typical of the decade, when busts were flattened and curves disguised. Coat, Liberty &amp; Co. Ltd.
Liberty's - a trendsetting fashion store in Regent Street, London - opened their dress department in 1884 under the guidance of the designer and former architect E. W. Godwin (1833-1886), a crusader for dress reform. This coat was especially designed and made for Mrs Hazel Moorcroft. The block-printed design of the lining fabric first appeared in about 1912 and was constantly re-issued - most recently in the 1970s. The cloche hat worn with it here is very typical of the 1920s. Superb materials and top-quality workmanship combine to create this stunning evening dress. Light-reflecting beads and sequins had long been popular decoration for evening fabrics, but in the 1920s the fashion reached its peak. The embroidery follows the lines of the printed floral design to enhance the pattern and catch the light. 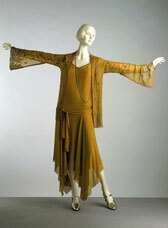 This dress was designed by the fashion house Callot Soeurs. Four sisters, Marie, Marthe, Regina and Joséphine, had opened a lace shop in 1888. The eldest, Marie (Madame Gerber), developed the couture side of the business at 9 avenue Matignon, Paris, where it continued until the mid 1930s. The sisters worked with exquisite and unusual materials, including Chinese silks and rubberised gabardine. 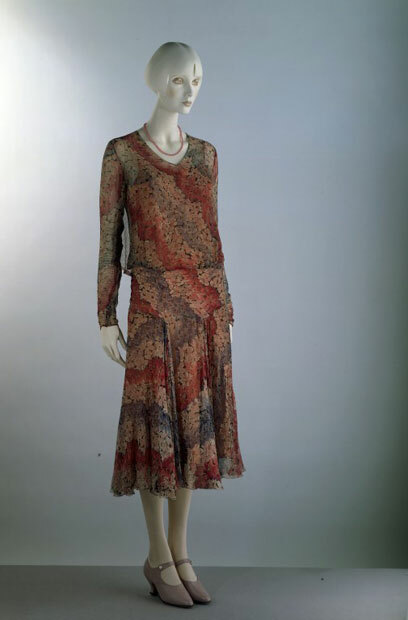 Callot Soeurs was also known for its use of lace and decorated sheer fabrics. 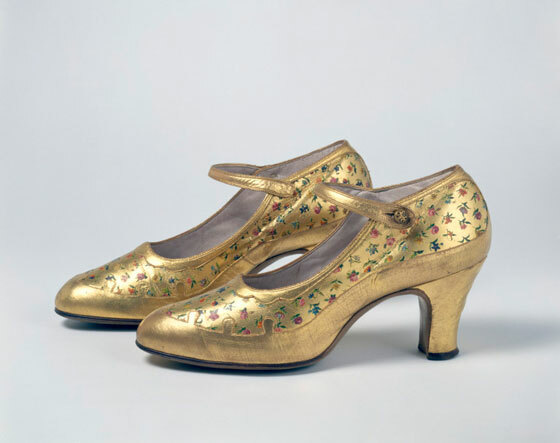 The 1920s produced some of the most exciting shoes of the century, with tremendous variety in cut, colour and ornamentation. Most shoes were high-heeled, even for dancing, necessitating straps over the instep. Bright colour mixes reached a peak by 1925. Skirts with handkerchief points were particularly fashionable in the late 1920s. They were forerunners of the longer skirts that became generally accepted by 1929. Soft, light-silk fabrics proved ideal for this bias-cut flowing style. Diaphanous silks were usually worn with matching petticoats, or laid over the foundation of the dress. 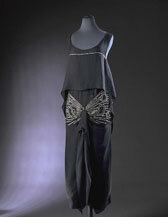 The few garments designed by Nabob in the V&A's collection are made from imported 'exotic' materials. This below-the-knee day dress made of printed silk chiffon is slightly gathered at a normal waistline on an elastic band. The skirt has a minutely pleated yoke that runs across the hips. There are two sets of fine pleats on the front of the skirt, which flares out slightly towards the knees. The printed pattern of waved bands of massed flower-heads is carefully disposed in all pieces of the dress. On the bodice, sleeves and skirt yoke the bands run diagonally, while on the skirt's bias-cut gores they run horizontally. The minute pin-tucks on the bodice, sleeves and skirt are hand sewn. 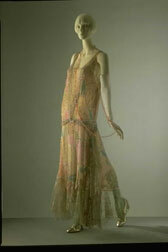 This design is typical of the years following 1929, when flowing summer dresses in gossamer fabrics with floral prints were popular. Such delicate silks are extremely difficult to handle and sew, demanding a great deal of skill and patience. 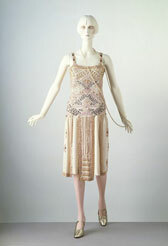 This sleeveless dress has a low square neckline, which was popular in the the mid 1920s. Its straight bodice is embroidered with a design that reveals the influence of Egyptian patterns. 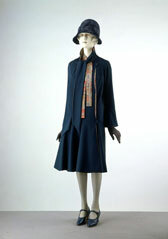 Jean Patou (1880-1936) was born in Normandy, France, the son of a tanner. His uncle owned a fur business, which Patou joined. In 1914 he opened a small dressmaking business, Maison Parry, in Paris and sold his entire opening collection to an American buyer. His career was interrupted by the First World War of 1914-1918, but in 1919 he reopened his salon, this time under his own name. His collections continued to be a great success. Along with 'Coco' Chanel he was considered a leading exponent of the androgynous 'garçon' look, creating smart, tubular, well-tailored clothes. Throughout the 1920s he also consistently championed the shorter length of skirt that did much to stimulate the demand for stockings. 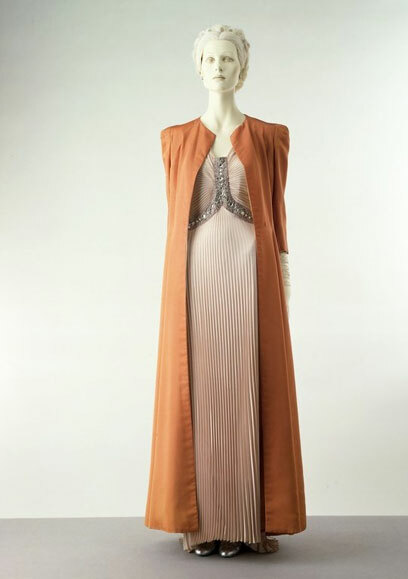 His long-waisted evening dresses with their emphasis on luxurious design and rich decoration were worn by famous actresses, such as Louise Brooks, Constance Bennett and Mary Pickford. Patou died in 1936, and his brother-in-law, Raymond Barbàs, took over the business. In 1963 the artistic direction of the company was taken over by Michael Goma. Evening dress suit, Charles Wallis Ltd.
By the 1920s the full evening dress suit had crystallised into a recognisable and lasting style. 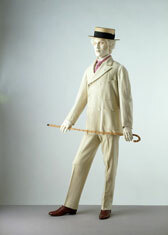 It consisted of a tail coat, a white waistcoat and trousers to match the coat. The coat was cut as double-breasted but was always worn open. 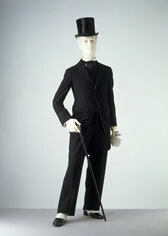 Changes in fashion did occur, but they affected details such as the width of the lapel or the cut of the trousers. 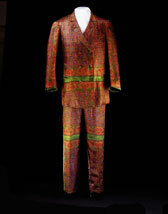 This suit was worn by the husband of the donor. She dated each item in her collection and also sent the accessories that she considered appropriate for each outfit. Mr Rothfield died in 1931. He was a slim, elegantly dressed man, who was meticulous about his dress. Throughout the 1920s Jeanne Lanvin (1867-1946) excelled in the creation of ultra-feminine dresses with fitted bodices and long, full skirts, known as robes de style, of which this evening dress is an example. The black fine silk taffeta dress with boat neckline, and small, capped half-sleeves fastens with poppers down the left side. A pair of immense fern-like fronds are machine-embroidered in furry cream chenille on the skirt, and the cream colour is echoed in floating bands caught in silk georgette bows at the right sleeve and left waist. Paul Poiret (1879-1944) was born in Paris. He opened his own salon after serving an apprenticeship for Douçet and working for Charles Frederick Worth (1825-1895). He was one of the most creative fashion designers of the 20th century. He also revived fashion illustration, founded a school for the decorative arts and even diversified into perfume. He led the forefront of the artistic fashion movement away from the curvilinear silhouette of the early 1900s towards a longer, leaner line. His brilliantly coloured, looser clothes, often inspired by the 'orientalist' enthusiasm for Eastern fashions and traditions, were extremely popular. The use of rayon trimmings on this garment is interesting. 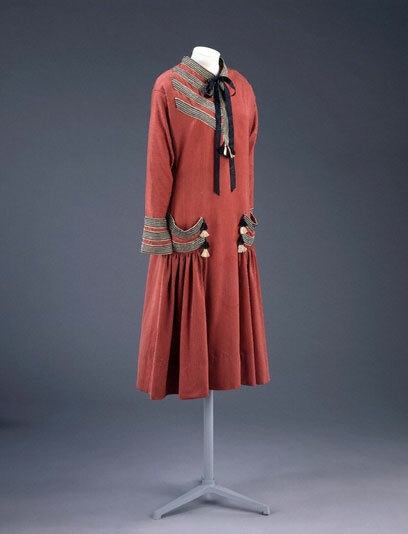 In spite of the rapid development in the 20th century of man-made fibres, couturiers tended to remain faithful to costly natural fabrics, with the exception of trimmings, such as the braid on this dress. Braid manufacturers were among the first bulk buyers of artificial silk, and were then joined by hosiery and underwear manufacturers. 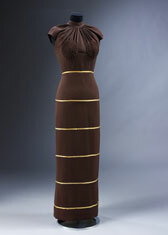 By the 1930s an increasing number of couturiers were attracted to the newly available and sophisticated rayon dress goods. The label in this little black dress simply reads 'Lord and Taylor'. This was the name of a prestigious department store on Fifth Avenue in New York. 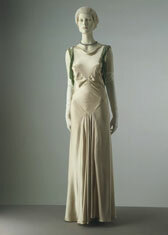 They imported Paris original haute couture (high fashion) and excellent copies of French models. They also sold unnamed ready-to-wear American designs. 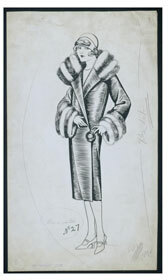 An illustration in the American edition of the fashion magazine Vogue' of 15 April 1926 identifies this dress. It was called 'Minuit Sonne' and designed by Drecoll. 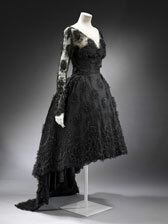 The dress is made of fine black silk voile and decorated with strass (a brilliant paste used for imitation stones). The diamanté butterfly bursting over the hips is a perfect example of the Art Deco style. The sleeveless design and low, scooped neck would have allowed the wearer to remain cool during even the most energetic dances of the 1920s. And as she danced, the drifting tunic top and the central drapery of the skirt would have flowed with her. The multi-talented Mariano Fortuny (1871-1949) was a painter, theatre designer, photographer, inventor and scientist, although he is best known as a creator of extraordinary fabrics and clothes. In 1909 he registered his design (based on the Ionic version of the Greek classical garment the chiton) for the 'Delphos' dress, of which this glistening black columnar example is a typical representative. The dress consists of five narrow widths of pleated silk hand-sewn into a tube just 47 cm wide. The neck and sleeves are adjusted to fit by concealed draw-strings, while a black rouleau, threaded with Venetian glass beads, laces the outer sleeves. The drop-waist androgyny of the previous decade gave way to a slinky femininity in the 1930s. 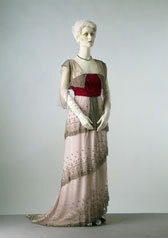 Parisian couturiers introduced the bias-cut into their designs, which caused the fabric to skim over the body's curves. 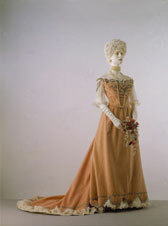 Long, simple and clinging evening gowns, made of satin were popular. Often the dresses had low scooping backs. During the day, wool suits with shoulder pads, and fluted knee-length skirts were worn. Fox fur stoles and collars were popular, as were small hats embellished with decorative feather or floral details, worn at an angle. Hair was set short and close to the head, often with gentle 'finger waves' at the hairline. Sports and beach-wear influenced fashionable dress, and the sun-tan was coveted for the first time. Men now generally wore three-piece suits for work or formal occasions only. Two-piece suits (without a waistcoat) and casual day wear were becoming increasingly common, including knitted cardigans, tank-tops, and soft collared or open necked shirts. For the first time it was not obligatory to wear a tie. Trousers were very wide, with turned up hems and sharp creases down the leg. They were belted high at the abdomen. It was common for men to be clean-shaven, and bowler hats were now generally only seen by city businessmen. Couturier clothing like this was custom-made for each individual client from the finest materials, and was out of most women's reach. However, couture influenced the silhouette and style of more affordable fashions and emulated aspects of it. 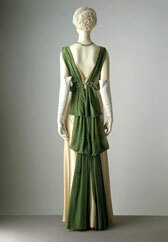 The prevalent 1930s style, pioneered by couturiere Madeleine Vionnet, was the bias cut. Bias cutting (where fabric is cut diagonally to the grain of the fabric) created garments that skimmed over the body's curves. 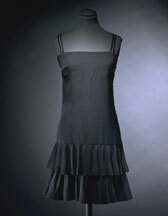 The 1930s silhouette is therefore slinky and close-fitting, with fluted skirts and features like scoop backs. The line was simple and uncluttered and few trimmings or accessories were worn. 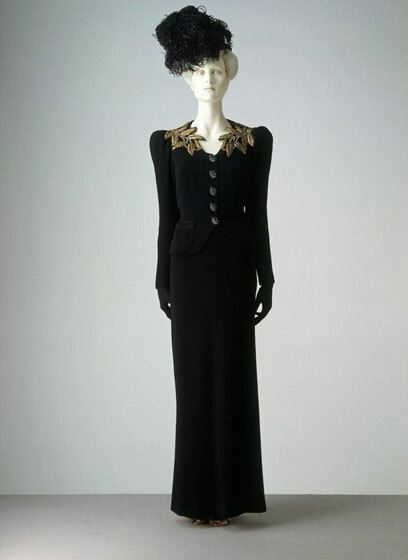 This 1936 evening dress is by Elsa Schiaparelli, who was known for her shock tactics and love of surrealism. Here, Schiaparelli has taken the intimate padding over the breasts which would normally be concealed, and used it to decorate the outside of a severe brown crepe dress. Crepe was very fashionable for both day and evening dresses during this decade. Couturier clothing like this was custom-made for each individual client from the finest materials, and was out of most women's reach. However, couture influenced the silhouette and style of more affordable fashions and emulated aspects of it. 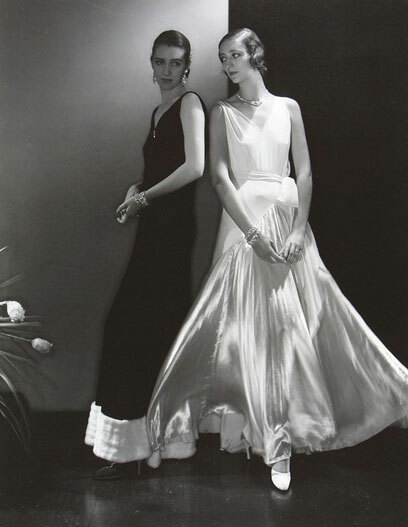 The prevalent 1930s style, pioneered by couturiere Madeleine Vionnet, was the bias cut. Bias cutting (where fabric is cut diagonally to the grain of the fabric) created garments that skimmed over the body's curves. The 1930s silhouette is therefore slinky and close-fitting, and was accessorised with bolero jackets or short capes as seen here. The line was simple and uncluttered and few accessories were worn. 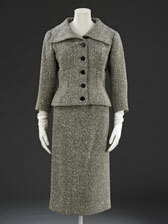 We usually associate Chanel's name with her practical classic suits, which first appeared in about 1917. 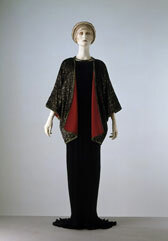 She also created extravagant evening wear such as this sequinned dress and cape. The combination of glistening black sequins and scarlet satin panels is very dramatic. 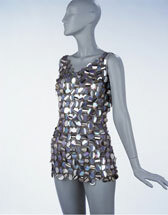 The rows of overlapping 'fish-scale' sequins emphasise the supple, falling lines of the outfit. The short, semi-circular cape has a scarlet satin lining. 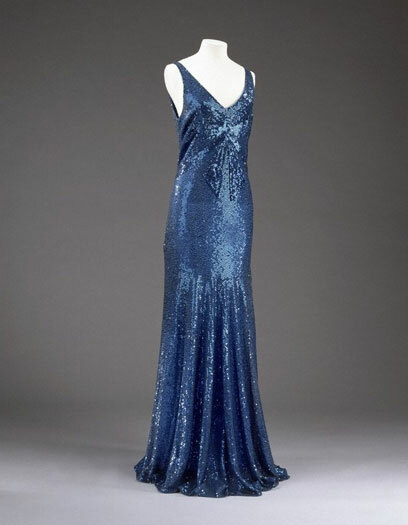 During the first half of the 1930s, evening dresses were designed to wrap women in luxurious, body-hugging sheaths, replacing the short, flat square gowns of the 1920s. 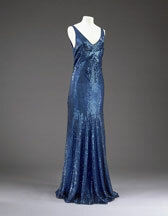 Evening gowns were mostly sleeveless, often displaying a bare back or a low neckline and inevitably touching the floor. White or pastel colours, fashionable in the 1920s and early 1930s, soon gave way to stronger, more acidic colours. After championing the modern, sporty and androgynous woman of the 1920s, Chanel successfully ventured into a luxurious and more feminine fashion in the 1930s. Though couture clothing like this was out of most women's reach, it inspired more affordable fashions. 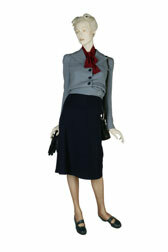 Coco Chanel championed comfortable and practical clothing for women. This evening dress, obviously designed for the summertime, is a remarkable example of Chanel's skills in developing elegant sportswear for the evening, creating a simple yet stunning evening dress for the sporty, modern woman of the 1930s. The navy, red and white ribbon of grosgrain makes reference to Chanel's own love of sailing, and her inspiration from sports. 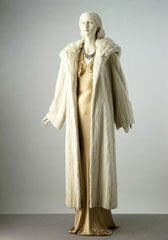 This dress and coat are typical of glamorous 1930s eveningwear. The dress is a simple, figure-skimming sheath dress made from satin, and the fur coat accentuates the shoulders. Couturier clothing like this was custom-made for each individual client from the finest materials. 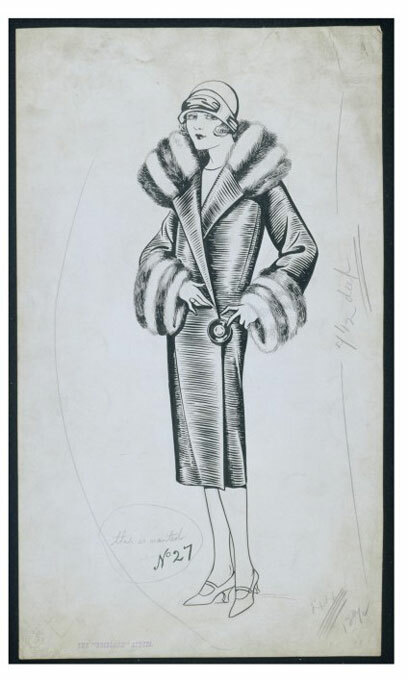 Couture influenced the silhouette and style of more affordable fashions, however, and fur was brought within the reach of many women as large fur collars or as stoles or wraps, which were all highly fashionable during the 1930s. 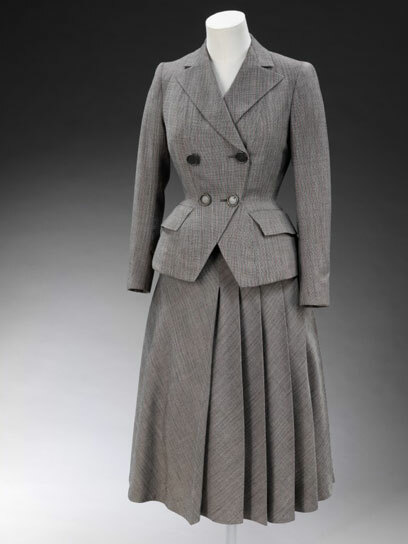 This suit sums up the 1930s silhouette with its sleek lines, nipped-in waist, square shoulders, and straight, pleated skirt. Tailor-made outfits were practical yet smart and well suited to town or country wear. Couturier clothing like this was custom-made for each individual client, and was out of most women's reach. However, couture influenced the silhouette and style of more affordable fashions, and dressmakers everywhere followed its lead. The prevalent 1930s style was the bias cut, in which fabric is cut diagonally to the grain of the fabric, creating garments that skimmed over the body's curves. The 1930s silhouette is therefore slinky and close-fitting and the line was simple and uncluttered. 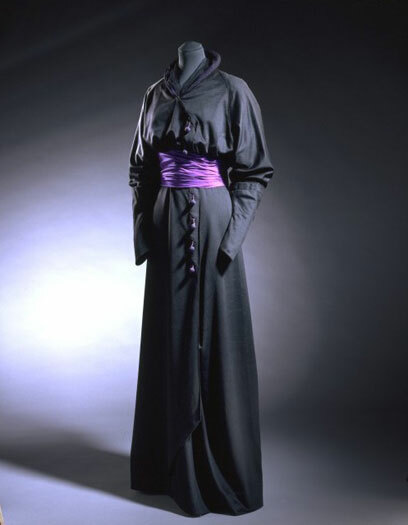 Towards the end of the 1930s, however, the fashionable silhouette altered slightly and the prevailing streamlined shape was gradually replaced by wider shoulders and constricted waists. Also, designers introduced embellishments like bold prints and surface decorations in an attempt to break away from the minimal adornment of the bias-cut line. This elegant evening ensemble was designed by London couturier Peter Russell. It was worn by Mrs John Fraser (Ruth Vincent) and given by her son, Mr John Fraser. 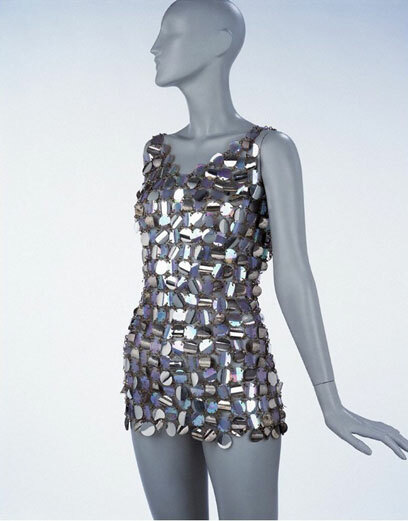 An almost identical version made in lamé was featured in Vogue magazine, where it was described as an ideal presentation dress. 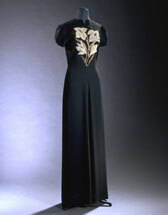 This elegant gown is typical of 1930s evening attire. Made in bias-cut ivory satin, it plunges at the back, clings to the torso and gently flares below the thigh. The cascade of velvet ribbons and diamanté buckles focuses attention on the back. During the First World War and through to the 1930s many women entered the work force for the first time, and wanted to reflect their new independence in the way they dressed. They wore practical clothing that was suitable for work, and many daring modern women took to wearing trousers. Many continued to sport short bobbed hair as they had in the 1920s. 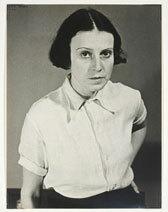 This portrait is of Ilse Bing (1899-1998), one of several leading women photographers in the inter-war period. Born into a Jewish family in Frankfurt, she initially pursued an academic career before moving to Paris in 1930 to concentrate on photography. Bing’s severe self-presentation of 1934 shows an independent, unadorned, determined professional. 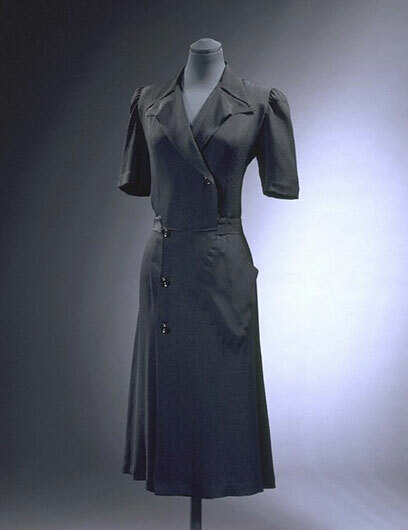 Towards the end of the 1930s the fashionable silhouette altered, and the prevailing streamlined shape was gradually replaced by wider shoulders and a more fitted waist, foreshadowing the silhouette that was to dominate the clothes of the 1940s. 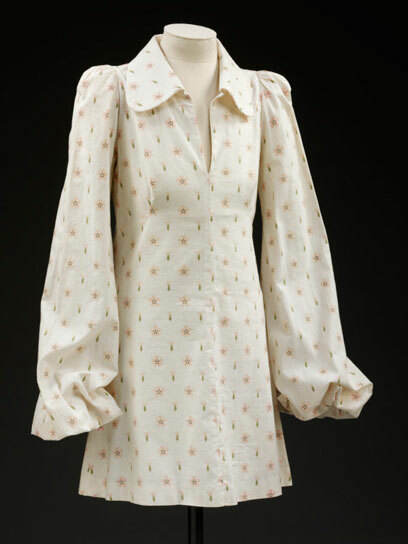 This 1938 ensemble by couturiere Elsa Schiaparelli features wide padded shoulders with embroidered leaves around the collar to further emphasise the exaggerated shape. Couturier clothing like this was custom-made for each individual client, and was out of most women's reach. However, couture influenced the silhouette and style of more affordable fashions, and dressmakers everywhere followed its lead. The prevalent 1930s style was the bias cut. Bias cutting (where fabric is cut diagonally to the grain of the fabric), created garments that skimmed over the body's curves. The 1930s silhouette is therefore slinky and close-fitting and the line was simple and uncluttered, with few trimmings or accessories. Simple dresses were teamed with short capes, boleros or jacket, and sequins were a favourite way of adding glamour to an outfit. 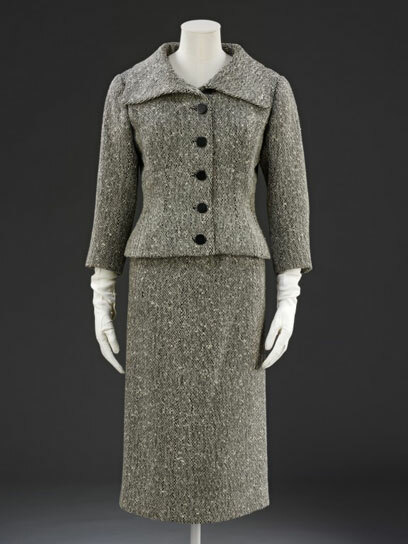 This straight-cut jacket is similar to the one worn by the Duchess of Windsor (Mrs Wallis Simpson) in her engagement photographs taken by Sir Cecil Beaton (1904-1980). She wore it over a long white crêpe dress with a sequin sash matching the jacket (American Vogue magazine, 1 June 1937, pages 52-57, British Vogue, 9 June 1937, pages 54-56). Beaton's photographs of Mrs Simpson in her Mainbocher ensemble were particularly successful. Its stark, simple lines suited her elegant, uncluttered style. 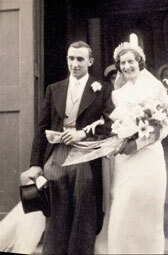 The bride wears a typical 1930s wedding dress, which features a long train, high-neck and long sleeves, with rather squared shoulders. The wreath is decorated with wax orange blossoms on wire stems, and was a popular wedding accessory of the decade. It was made to sit on top of the head, both as a decoration and a way of holding the long veil in place. Wedding wreath, Liberty &amp; Co. Ltd.
Wreaths decorated with small wax flowers - in this case, orange blossoms on wire stems - were popular wedding accessories of the 1930s. They were made to sit on top of the head, both as a decoration and a way of holding the long veil in place. 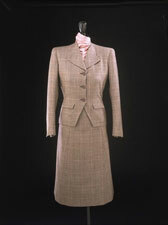 Couturier clothing like this was custom-made for each individual client, and was out of most women's reach. However, couture influenced the silhouette and style of more affordable fashions, and dressmakers everywhere followed its lead. The prevalent 1930s style was the bias cut, in which fabric is cut diagonally to the grain of the fabric, creating garments that skimmed over the body's curves. The 1930s silhouette is therefore slinky and close-fitting and the line was simple and uncluttered, with few trimmings or accessories. 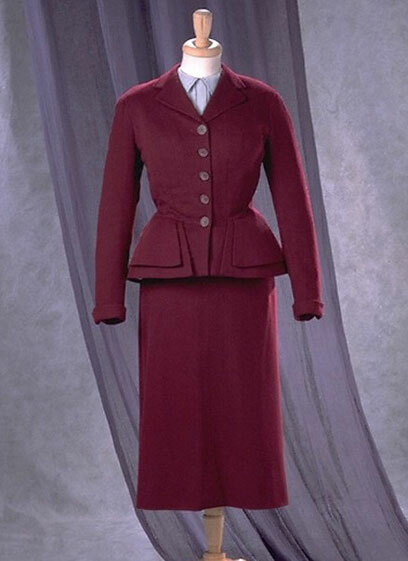 Couturier clothing like this was custom-made for each individual client, and was out of most women's reach. However, couture influenced the silhouette and style of more affordable fashions, and dressmakers everywhere followed its lead. Only a few outfits in the V&A's collection illustrate 1930s day attire but, luckily, one is this ultra-fashionable ensemble by couturiere Madeleine Vionnet. The dress is cut on the bias - a prevalent 1930s trend, creating garments that skimmed over the body's curves. 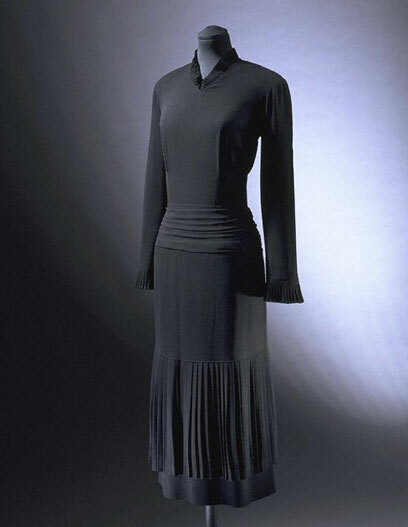 The 1930s silhouette is therefore slinky and close-fitting and the line was simple and uncluttered, with few trimmings or accessories. Simple dresses were teamed with short or long capes, or boleros. Couturier clothing like this was custom-made for each individual client, and was out of most women's reach. However, couture influenced the silhouette and style of more affordable fashions, and dressmakers everywhere followed its lead. The prevalent 1930s style was the bias cut, in which fabric is cut diagonally to the grain of the fabric, creating garments that skim over the body's curves. The 1930s silhouette is therefore slinky and close-fitting. The line was simple and uncluttered, with few trimmings or accessories. Towards the end of the 1930s, the fashionable silhouette altered slightly and the prevailing streamlined shape was gradually replaced by wider shoulders and constricted waists, as seen here. Also, designers introduced bold prints and colours in an attempt to break away from the minimal adornment of the bias-cut line. As a result of the war there were severe fabric shortages, which lasted until the end of the decade. Clothes were made with a minimum of fabric, few pleats and no trimmings. Skirts were a little below the knee and straight, worn with boxy jackets and broad, padded shoulders. Many men and women wore uniforms. From 1942 onwards some clothes were made under the government Utility Scheme that rationed materials. They are identifiable by a 'CC41' stamp, which is an abbreviation of the 'Civilian Clothing Act of 1941'. During the war, accessories were important because of their relative affordability; tall platform shoes or sandals, and tall flowery hats were fashionable. Hair was worn long, with stylised waves and rolls on top of the head. 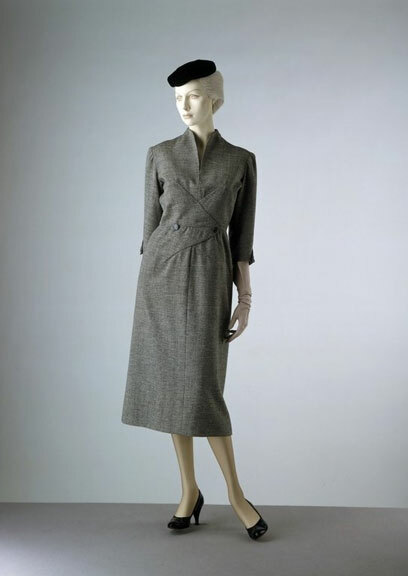 In 1947, Christian Dior introduced his 'New Look', which revolutionised1940s fashion. Skirts became longer and fuller, and boxy shoulders were softened to become sloping. Waists were cinched and hats grew wide and saucer shaped. During the war, most men wore military uniform of some kind. Hair was short at the back and sides, and most men were clean shaven. Men in civilian clothing were often dressed in lounge suits with broad shoulders, with wide trousers belted high at the abdomen. After 1945 many men leaving the armed forces were issued with a 'de-mob' suit, consisting of shirt, tie, double-breasted jacket and loose fitting trousers. 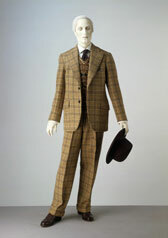 The lounge suit dominated men's dress from the 1920s onwards. It was worn at events and in places where in previous decades more formal attire would have been required. By 1940s men were wearing lounge suits with a pullover in place of a waistcoat. Pullovers were previously worn for informal and sporting occasions but they gradually became integrated into mainstream fashion. 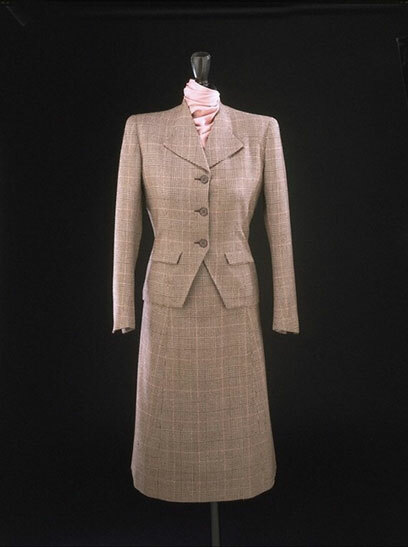 This suit was worn by HRH The Duke of Windsor. As Prince of Wales he had been crowned King Edward VIII in 1936, but he abdicated the same year and took the title of The Duke of Windsor. The Duke was acknowledged internationally as the leader of men's fashion. He rebelled against the stiff formality of dress and became famous for his casual style. Using the best London and New York tailors, he continued to be adventurous in his love of bright colour, strong texture and bold pattern. 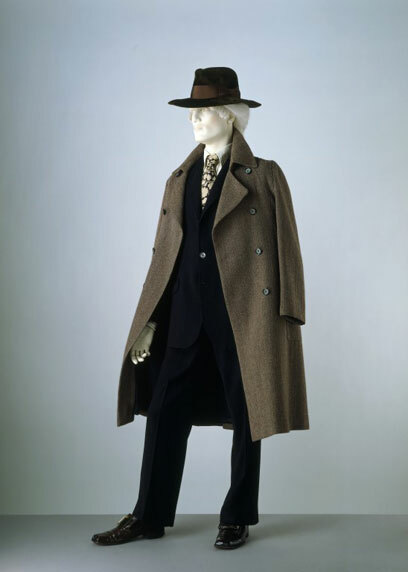 The Duke gave this suit to Sir Cecil Beaton, who was then collecting fashionable dress for his 1971 exhibition, 'Fashion: An Anthology'. The Utility scheme was devised to share and conserve scarce resources, whilst creating practical and stylistically appealing clothing. 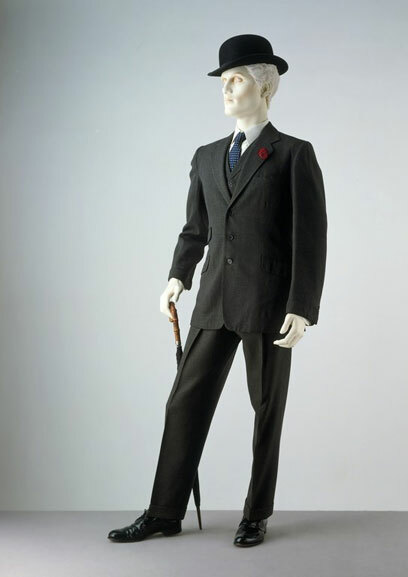 With its double-breasted cut, peaked lapels and wide straight-legged trousers, this suit is typical of the period. The breast pocket is stay stitched rather than interlined to economise on fabric. The pocket bags and waistband facings are made in cheap quality cotton. The suit bears the CC41 label, which stands for the Civilian Clothing Act of 1941. 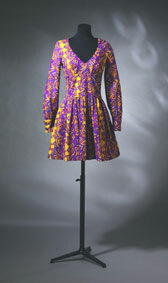 This day dress is from the Utility Collection by the Incorporated Society of London Fashion Designers for the Board of Trade. It may have been designed by Edward Molyneux. The simplification and economy of material match the conditions laid down by the Board in relation to the manufacture of civilian clothing during the Second World War of 1939-1945. Then, both hand-crafted and mass-produced tailoring was as important as it is today. But, despite the best efforts of the fashion designers to be inventive without wasting precious fabric, there was a very limited choice. The Utility Scheme was introduced by the Board in 1941 to ensure that low- and medium-quality consumer goods were produced to the highest possible standards at 'reasonable' prices. These standards complied with restrictions and rationing of raw materials. The word 'Utility' was applied to garments made from Utility cloth, which was defined in terms of minimum weight and fibre content per yard. Utility clothes were usually identified by a distinctive double crescent CC41 (Civilian Clothing) label. 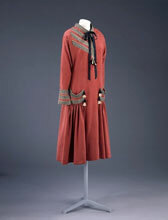 When offering this day dress to the Museum in August 1942, Sir Thomas Barlow explained that it conformed 'in simplification and economy of material to the conditions laid down by the Board of Trade in relation to the manufacture of civilian clothing'. This is a good example of a Utility suit. During the Second World War both hand-crafted and mass-produced tailoring was as important as it is today. But, despite the best efforts of fashion designers to be inventive without wasting precious fabric, there was a very limited choice. The Utility Scheme was introduced by the Board of Trade in 1941 to ensure that low and medium quality consumer goods were produced to the highest possible standards at 'reasonable' prices. These standards complied with restrictions and the rationing of raw materials. The word 'Utility' was applied to garments made from Utility cloth, which was defined in terms of minimum weight and fibre content per yard. Utility clothes were usually identified by a distinctive double crescent CC41 (Civilian Clothing) label. This is a good example of a Utility Suit. It is from the Utility Collection by the Incorporated Society of London Fashion Designers for the Board of Trade. It may have been designed by Victor Stiebel. The simplification and economy of material match the conditions laid down by the Board in relation to the manufacture of civilian clothing during the Second World War of 1939-1945. Then, both hand-crafted and mass-produced tailoring was as important as it is today. But, despite the best efforts of the fashion designers to be inventive without wasting precious fabric, there was a very limited choice. The Utility Scheme was introduced by the Board in 1941 to ensure that low- and medium-quality consumer goods were produced to the highest possible standards at 'reasonable' prices. These standards complied with restrictions and rationing of raw materials. The word 'Utility' was applied to garments made from Utility cloth, which was defined in terms of minimum weight and fibre content per yard. Utility clothes were usually identified by a distinctive double crescent CC41 (Civilian Clothing) label. The bloused jacket with square, padded shoulders closely resembles the battledress top of an army uniform. It is Board of Trade pattern no. 33, and the retailers' maxiumum selling price for the suit in 13/13 1/2 oz woollen frieze was £4 2s 2d. The spring 1947 collection of Christian Dior (1905-1957) caused a sensation and was christened 'The New Look' by Carmel Snow of Harper's Bazaar. Dior offered the glamour and romance of full skirts and nipped-in waists to women who were tired of utilitarian clothes with boxy silhouettes, mannish square shoulders and practical short skirts. This intricately cut afternoon dress of black wool, named 'Maxim's', was worn with a black tulle cartwheel hat, long black gloves and simple black court shoes. 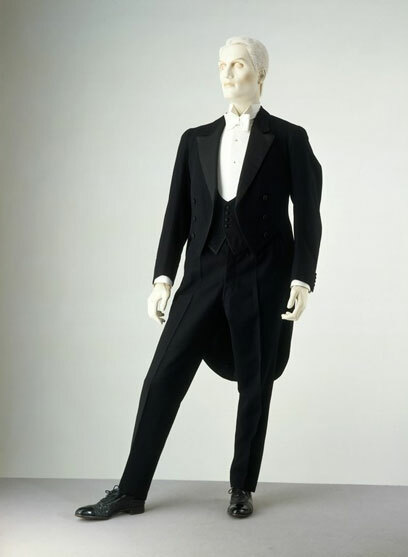 To emphasise the bust, a large silk velvet bow was set into the low, square neckline and the waist was compressed by a cummerbund-style lower bodice. A heavy ribbed silk petticoat supports and defines the skirt. The dress fastens with a zip down the back . This is a good example of a Utility Suit. It is from the Utility Collection by the Incorporated Society of London Fashion Designers for the Board of Trade. The simplification and economy of material match the conditions laid down by the Board in relation to the manufacture of civilian clothing during the Second World War of 1939-1945. Then, both hand-crafted and mass-produced tailoring was as important as it is today. But, despite the best efforts of the fashion designers to be inventive without wasting precious fabric, there was a very limited choice. The Utility Scheme was introduced by the Board in 1941 to ensure that low- and medium-quality consumer goods were produced to the highest possible standards at 'reasonable' prices. These standards complied with restrictions and rationing of raw materials. The word 'Utility' was applied to garments made from Utility cloth, which was defined in terms of minimum weight and fibre content per yard. Utility clothes were usually identified by a distinctive double crescent CC41 (Civilian Clothing) label. 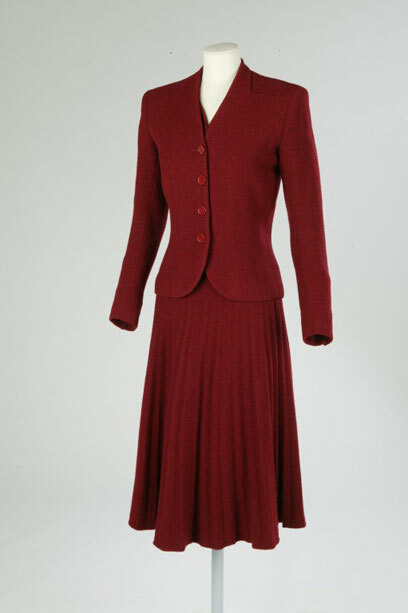 When offering this jacket and skirt to the Museum in August 1942, Sir Thomas Barlow explained that 'they conform in simplification and economy of material to the conditions laid down by the Board of Trade in relation to the manufacture of civilian clothing'. This curvaceous suit has the small waist and wide, padded hips inspired by Christian Dior's instantly popular 1947 'New Look' collection. Though, the square shoulders recall earlier styles and show that this lady may have resisted a complete change in style. Hardy Amies skilfully overcame the continuing shortages and regulations governing the availability and use of materials in the early post-war period. 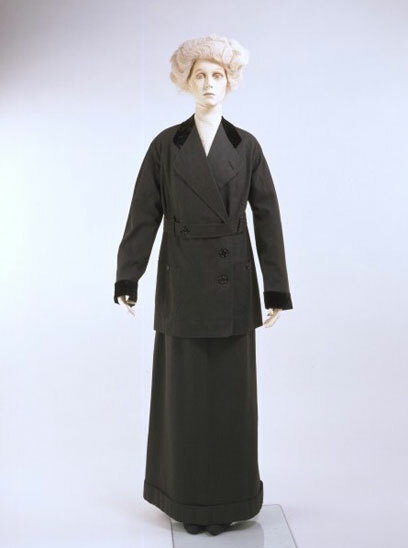 This superbly tailored double-breasted jacket has a nipped-in waist and pockets with deep flaps which curve over and accentuate the hips. The long bias-cut skirt has soft pleats at the front right and the back left, which creates a flattering garment that also economises on fabric. 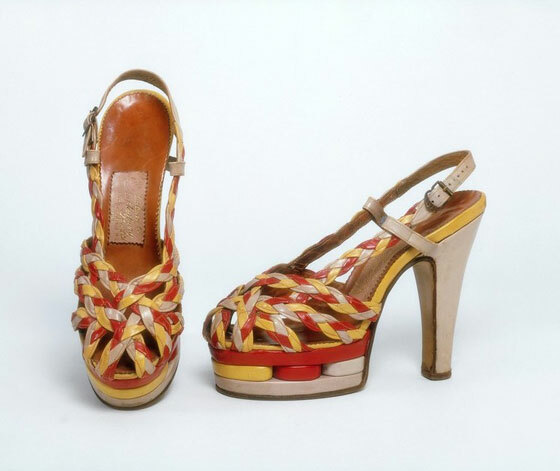 This pair of shoes is typical of the mid 1940s, during which time it was fashionable to wear tall platform shoes. Because of war-time shortages, the platform soles were often made out of cork. In keeping with the fashion for height, hair was worn piled high on top of the head, and clothing was narrow with exaggerated padded shoulder. 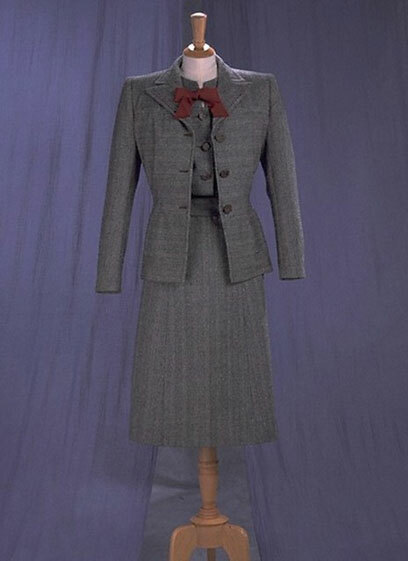 This suit is typical of the 1940s post-war 'New Look'. 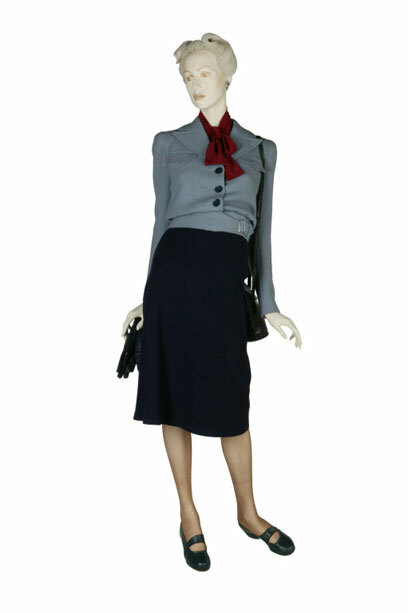 The skirt is straight and slightly below the knee in length, while the jacket features a nipped in waist, padded hips, and sloping shoulders inspired by Christian Dior's 'New Look' collection of 1947, which moved fashion away from the boxy, military look of the war years. A meticulously tailored but perfectly plain suit is transformed by carefully engineered details. The focus on this jacket is the double-flared panels which draw attention to the hips. The long straight skirt has a central block of kick pleats at the back, which allow ease of movement. The suit is completed by a matching turban-style hat in claret and black, and a hand-embroidered silk blouse in delicate blue-grey. In 1942, the British Government established the Utility Scheme to ration materials and regulate the production of civilian clothing during the war. Utility Scheme clothes bear a printed stamp reading 'CC41', an abbreviation of the Civilian Clothing Act of 1941. This overall, or housedress, was designed to Utility standards. It has no more than two pockets, five buttons, six seams, 160 inches of stitching and no superfluous decoration. It is made of a floral printed fabric, an area of textile production in which Britain has long excelled. It is typical of the 1940s, when shoulder pads and full puffed sleeves were fashionable. Skirts were typically narrow, giving dresses a rather top-heavy look. A black afternoon dress with a good label was both a chic choice and a sensible one. Edward Molyneux (1891-1974) could be relied on to provide streamlined distinction. 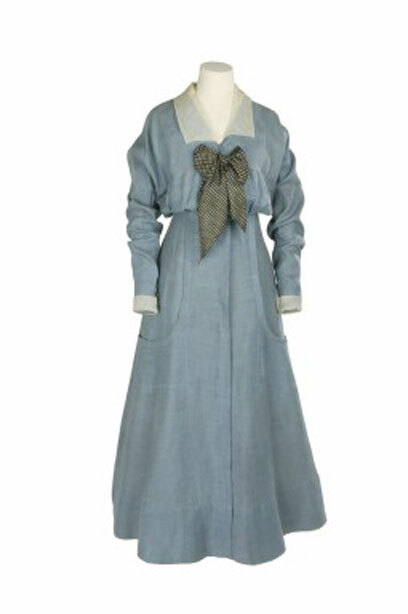 This dress has a schoolmistress-like authority and propriety; its covered-up look features a demure high neck, long sleeves and a safe, calf-length skirt. However, Molyneux transformed it into a little black dress with attitude by cutting the matt crepe to skim sensuously over the body's curves and by introducing pleats at salient points. A wide sash arranged in folds below the waist emphasised the slenderness of the wearer. The dress buttons down the back. 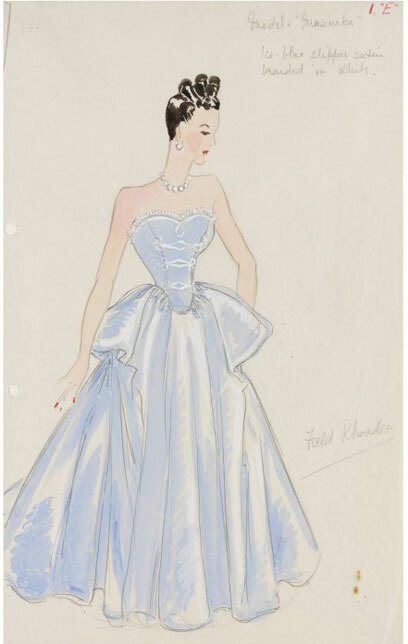 This is a fashion design depicting a woman in an ice-blue evening dress, designed by Marjorie Field in the 1940s for the haute couture firm Field Rhoades of 77, South Audley Street, London. The dress is typical of the mid to late 1940s, when full skirts and padded or paniered hips were very fashionable. This style was fashionable into the early 1950s, but the hairstyle marks it out as a particularly 1940s model. Here the hair is shown piled high, in curls, on top of the head. In the 1950s hair was worn in chignons towards the back of the head or at the nape of the neck, or cropped short in a gamine style. 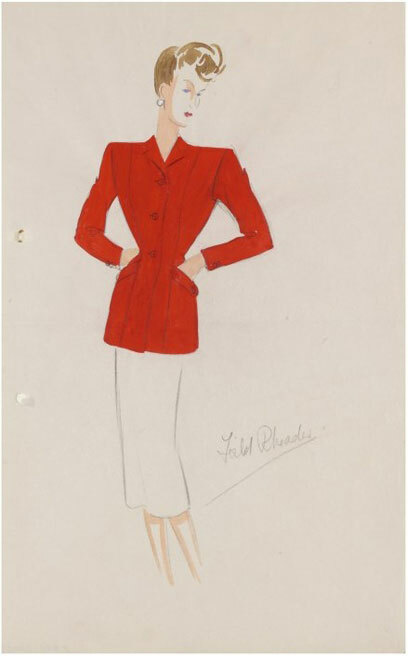 This is a fashion design for a day suit, designed by Marjorie Field in the 1940s for the couture firm Field Rhoades of London. 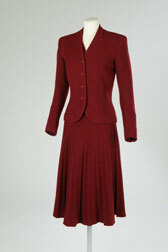 It depicts a typical mid 1940s day suit, with very wide shoulder, a nipped in waist and a straight, knee-length skirt. The woman wears her hair piled fashionably high on top of her head. The design would probably have been used as a presentation drawing, for clients to decide which model they wanted to have made. 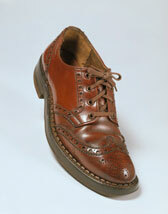 This is a pair of men's brogue shoes, made of leather. The traditional brogue employs circles and dots born along the lines of the shoe's construction, emphasising the stitching, and as a prominent field pattern on the toecap. 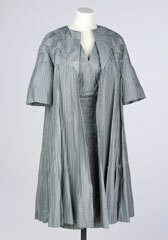 In 1942 the British Board of Trade commissioned ten members of the recently formed Incorporated Society of London Designers to create a collection of regulation day wear under the auspices of the Utility scheme, an austerity measure introduced by the Board of Trade during the Second World War, when clothes were rationed. Smart yet practical, this shirtwaister - a kind of tailored shirt-dress - was the only black garment in the designer Utility collection. 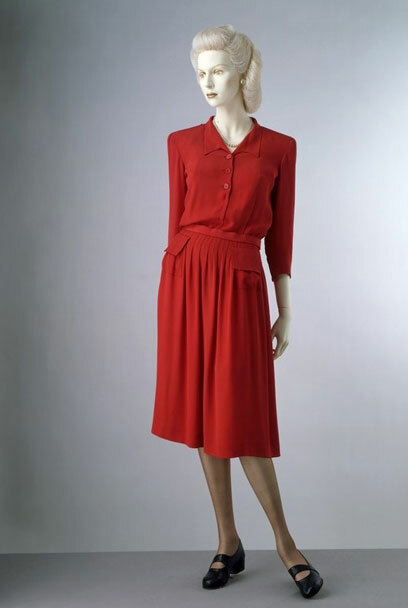 The rayon crepe dress has all the characteristics of wartime clothing - broad shoulders (shaped by heavy flock pads), a skirt length just below the knee and a square silhouette, but it also has also eye-catching details, such as bold lapels and a roomy pocket set diagonally on the left hip. Elsa Schiaparelli (1890-1973) enjoyed the enormous publicity that her more bizarre creations generated, but her less provocative designs rarely caused a furore and have been somewhat neglected. She often referred to her simple black dresses and their versatility, and regularly wore black herself. 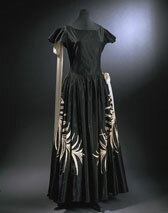 Schiaparelli gave this dress to the V&A after her retirement. Here she composed a short-sleeved dress in matt black crepe. The extremely simple, fluid shape is relieved by a slashed neckline and a bold embroidered spray of lilies (by the specialist embroidery company Lesage) in various sizes of pearls, sequins and metallic strip. The dress fastens with a black plastic zip on the left-hand side. 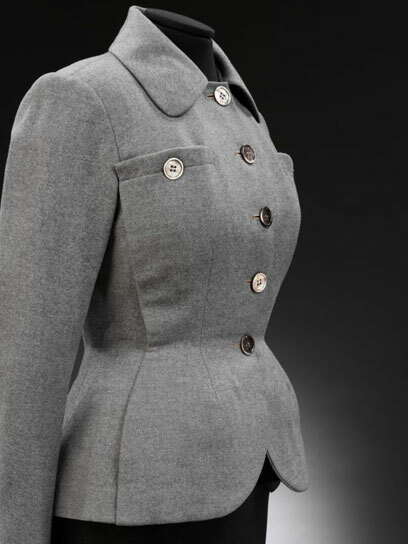 The buttons on this tailored ensemble bear a wartime message. They are stamped with the Utility symbol CC41, which stands for Civilian Clothing and 1941. The Utility Scheme was introduced in 1941 to ensure that consumer goods were produced to the highest possible standards at 'reasonable' prices. These standards complied with restrictions and rationing of raw materials. Utility clothes were usually identified by a distinctive double crescent CC41 (Civilian Clothing) label. Reginald Schipp designed the symbol. He was asked to disguise the 'CC' so that the public would not recognise the letters as such. This stylised motif became known as 'the cheeses' and was also printed on to clothing labels. The Board of Trade commissioned the design for this jacket, skirt and blouse from the Incorporated Society of London Fashion Designers. It was one of 32 stylish yet economical outfits intended for general production. 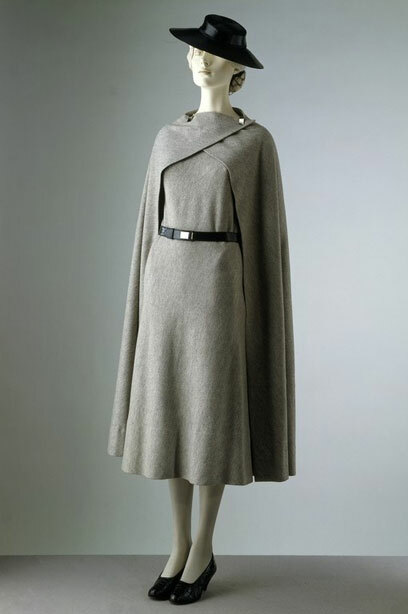 In October 1942 Vogue magazine published the following description of the collection: 'All the designs are, of course, within the New Austerity specifications: only so many buttons, this much cuff and that much skirt...but they are an object lesson in the power of pure style over mere elegance'. Although the designers of individual pieces were not publicised, this suit has Digby Morton's initials inked on a paper tag. The label also identified it as 'No 16 Original DM 92/10' with a maximum price tag of just under £5.00. There is a Morton label inside the blouse, making it one of only two Utility prototype garments labelled by the original designer. The other piece is a Bianca Mosca blouse. 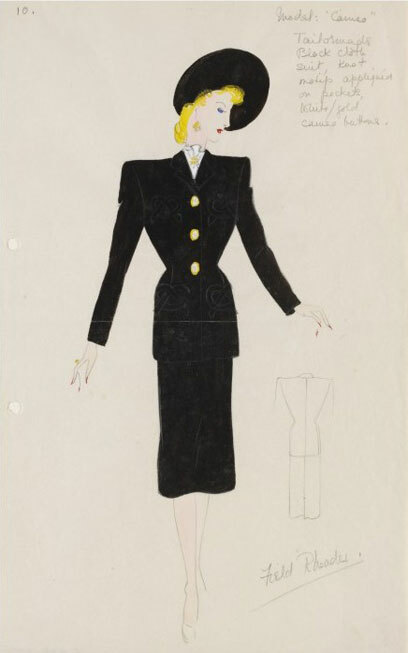 This is a fashion design for a black suit, designed by Marjorie Field in the 1940s for the couture firm Field Rhoades of London. 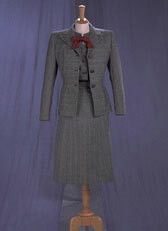 It depicts a typical mid 1940s day suit, with very wide shoulder, a nipped in waist and a straight, knee-length skirt. The design is signed with the name of the firm, and would probably have been used as a presentation drawing, for clients to decide which model they wanted to have made. 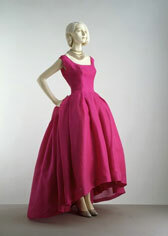 The 1950s continued the late 1940s style with very full skirts, cinched waists and sloping shoulders. Another popular silhouette was the narrow pencil-skirt look. Daywear consisted of skirts and jackets or day dresses in tweeds and woollens. Dresses with pencil or full skirts were seen in either plain fabrics or floral prints. Separates were popular, especially waist length cardigans. Hats were either small pill-box styles or large brimmed, saucer-like hats. Hair was often cropped quite short and set in curls, or kept long and tied in simple chignons or ponytails at the back. Men's fashions still revolved around the suit. Grey flannel suits were common, worn with shirt, tie and pocket handkerchief. Tweed or check jackets worn with non-matching trousers were also popular, and open collars were permitted for casual wear. Hair was worn with a side parting but slicked back with 'Brill cream'. Teenagers began to appear as a separate group during the 1950s. Their fashions were influenced by American stars, who wore leather jackets and jeans. The Teddy Boys, who wore pointed shoes, tight trousers and long jackets with velvet trim, were also a significant teenage group. 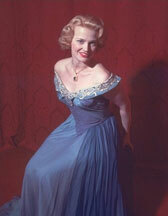 This photograph of the pop singer Eve Boswell (1922-98) shows her in a typical 1950s evening dress. The dress features a full, almost ankle-length skirt with sunray pleats. Her hair is cut quite short and set with curls around the face. This photograph shows the 1950s pop singer, Lita Roza, in fashionable '50s dress. She wears a full, mid-calf length skirt with several petticoats underneath for volume, teamed with a colourful cardigan. Her hair is cut fashionably short, and she wears bright red lipstick. 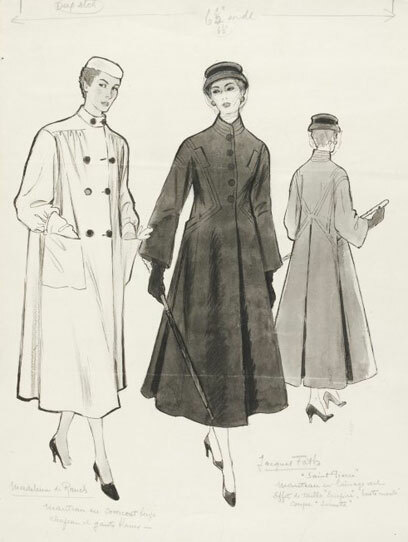 The coats illustrated here are typical of the 1950s. The coat on the right has sloping shoulders and a long, full skirt, reflecting the prevalent 1950s silhouette. It would have accommodated a voluminous 'New Look' style skirt underneath it. The coat on the left hangs from the shoulders, and would have been worn over narrower pencil skirts or day dresses. Women usually wore hats outdoors in the 1950s, and the small pill-box type (as seen here) was very fashionable. The originators were probably influenced at first by their familiarity with the customary civilian dress for Guards officers, which consisted of a bowler hat, a double-breasted overcoat known as a 'British warm', a striped shirt with white collar and pin-stripe trousers. 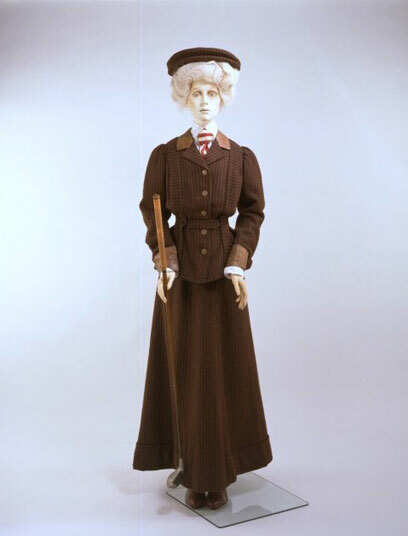 The traditional and conservative styling of these overcoats and trousers would have blended in quite naturally with the 'Edwardian' image. The donor to the Museum of this suit took his inspiration directly from the Edwardian period (Edward VII reigned 1901-1910) by requesting his tailor to copy a suit worn by Sir Winston Churchill in 1911 that was shown in a photograph of the time. This photograph shows the pop singer Patti Lewis in her dressing room. Her hair is cut short and set in curls, which is a typical style of the 1950s. She wears light eye make-up and bright red lipstick. She wears casual, youthful dress, inspired by teenage and rock and roll fashions. This suit comprises a fitted jacket and slim-fitting skirt with a kick pleat at the back. It was shown in Balenciaga's Winter collection in 1954 as model no. 55. It reveals Balenciaga’s debt to his training in tailoring in Spain and his capacity for choosing fabrics fit for purpose. His suits were highly regarded and commanded high prices. In the early 1950s, a made-to-measure woollen suit from Balenciaga cost about £112, a sum well beyond the reach of most consumers. He was adept at manipulating firm fabrics. The style of jacket relies for effect on careful fitting to the body in front and gentle fullness at the back, and in the setting of the sleeves. Balenciaga was renowned in the trade for inspecting and resetting sleeves that were not perfect. 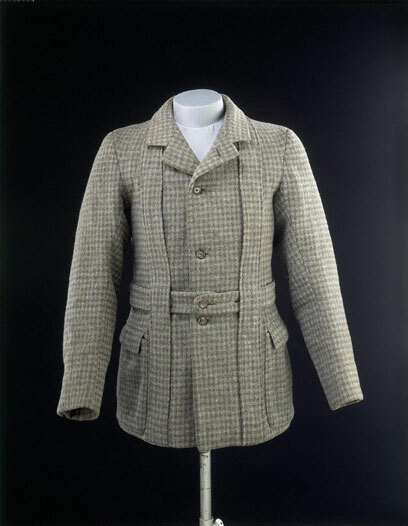 Tweed was a sturdy woollen fabric that appealed to Balenciaga because of the optical illusions created by the two or more colours in the indistinct flecked pattern. 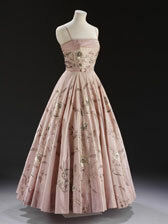 This dress is typical of a conservative ensemble of the 1950s. This might have been worn by an older woman, with a hat, gloves and handbag for a special occasion such as a wedding. 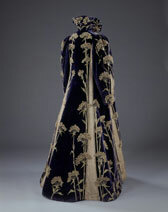 Hundreds of tiny pin-tucks cover the entire surface of both dress and coat in this blue-green silk ensemble by Hartnell. The detail around the top of the outfit shows how the garment is formed from interwoven strips of silk in a simple basket weave, a play upon the construction of woven fabric which is further emphasised by the patterning of the narrow tucks. 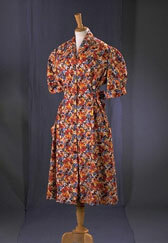 Horrockses’ cotton dresses, with their brightly coloured prints and full gathered skirts, were a fashion success story for the post-war period. Horrockses was a large cotton manufacturing firm, founded in Preston in 1791, known for weaving high quality household cottons. In 1946 they launched Horrockses Fashions Limited, a subsidiary company making ready-to-wear dresses, housecoats and beachwear, with a headquarters in London's Hanover Square. The success of the firm was due to the quality of the design of the vibrant printed cottons, often commissioned from artists, combined with advanced production methods, which maintained the crisp cotton despite frequent washes. 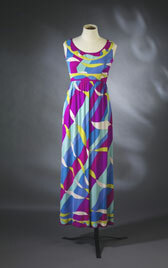 Dresses from Horrockses Fashions appealed to women of different ages and social backgrounds as the perfect summer dress. They were relatively expensive and were popular with members of the Royal Family - but working women would save up to buy one, often as a honeymoon outfit. 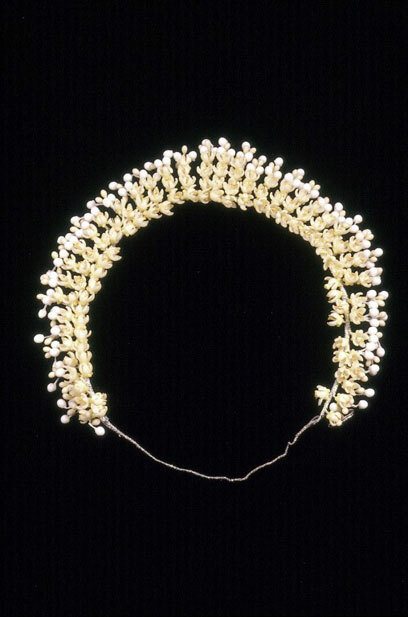 This example was worn by Elizabeth Payze as a teenager. Christian Dior (1905-57) launched his couture house in 1947, and soon became one of the most successful fashion designers of the 20th century. The smooth silhouette of this dress is formed by underpinnings and petticoats. The draped fabric knot is inspired by 19th-century dress, and is typical of Dior's historicism. The House of Worth, established in Paris in 1858 by Charles Frederick Worth (1826-95), was the original and founding couture house. Worth London was an offshoot of the original. 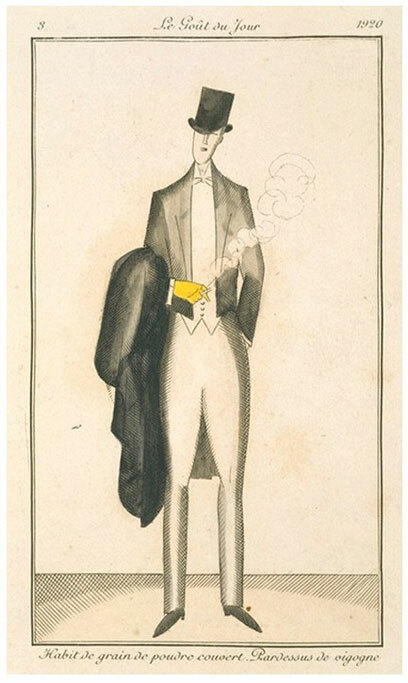 It created refined, well-mannered garments for a mainly English clientele for the London social season. Mrs Roy Hudson was a friend of Miss Whistler, Worth's head vendeuse (personal saleswoman). 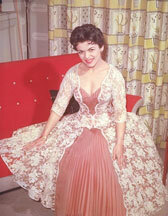 She purchased Worth gowns between 1947 and 1962. This dress dates from about 1955, when Owen Hyde-Clark was the chief designer. Worth was known for delicately embroidered dresses in shades of champagne and rose, and this dress is typical of the house's style. The skirt is cut as a complete circle. It needed many layers of petticoats to fill the skirt and show the embroidery to its best advantage. Worth (London) Ltd closed in 1967. 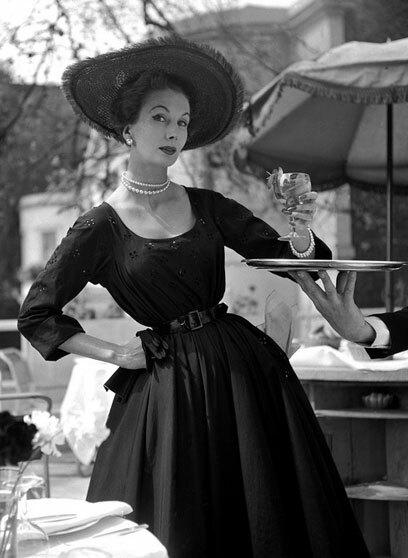 Cocktail dresses gained a new popularity after the Second World War. They were worn at early evening or '6 to 8' gatherings. Since guests usually stood and mingled the gowns could include complex bustles and skirt details, which would be crushed if sat on. 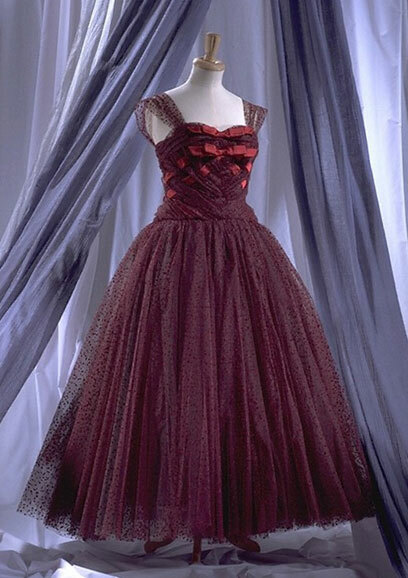 In his book 'The Little Dictionary of Fashion' (1954) Christian Dior (1905-57) described cocktail dresses as 'elaborate and dressy afternoon frocks', preferably in black taffeta, satin, chiffon and wool. These confections became the personification of the 'little black dress' and were often accessorised with gloves and small, elaborate hats. 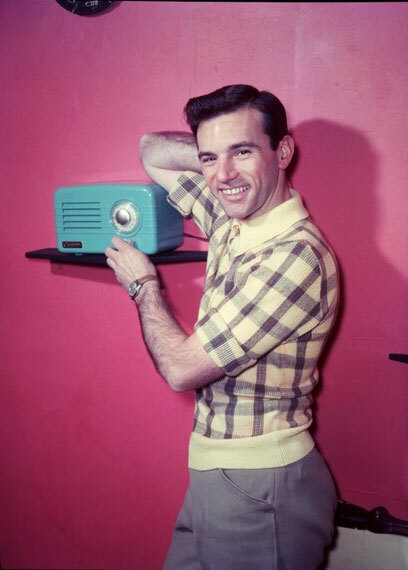 This photograph shows the popular 1950s singer, Dennis Lotis. He wears loose chinos and a pastel coloured, check sweater with a collar. Knitwear separates were very popular for men during the 1950s, and tank-tops, cardigans and jumpers were often worn with open neck shirts or sometimes with shirt and tie. Lotis' hair is worn in a fashionable side parting, but slicked to the side and back with Brillcreem. 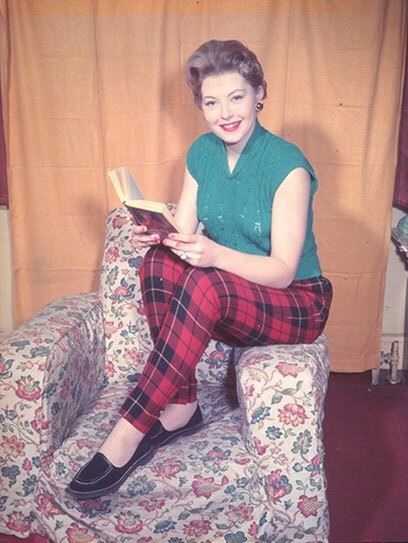 This photograph shows 1950s supermodel, Barbara Goalen, modelling a 'New Look' style outfit. The skirt is full, the waist cinched in with a belt, and she wears a wide saucer hat. 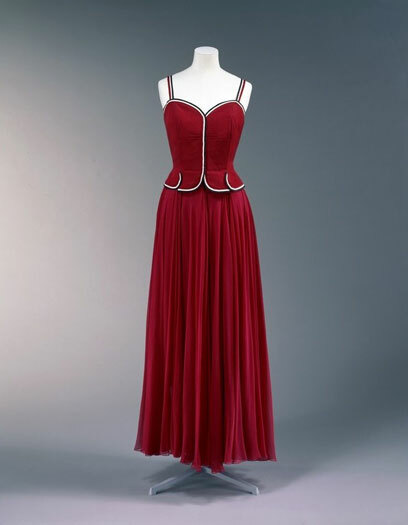 The exaggerated hourglass figure was the fashionable ideal for women during the 1950s. The little black dress was a classic design. Women could wear them for work during the day and then, with a change of accessories, wear them out in the evening. This version was designed by Jean Dessès in about 1955. It has a modest bodice with a high neck and long sleeves. 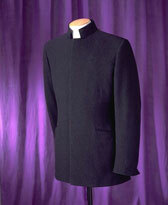 The bodice is made in matte wool and fastens in the front with self-covered buttons. It has been cut and fitted to fit closely. 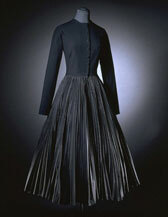 The skirt is made of pleated lustrous silk taffeta. Cocktail dresses gained a new popularity after the Second World War. They were worn at early evening or ‘6 to 8’ gatherings. Since guests usually stood and mingled, the gowns could include complex bustles, appliqué and skirt details, which would be crushed if sat on. 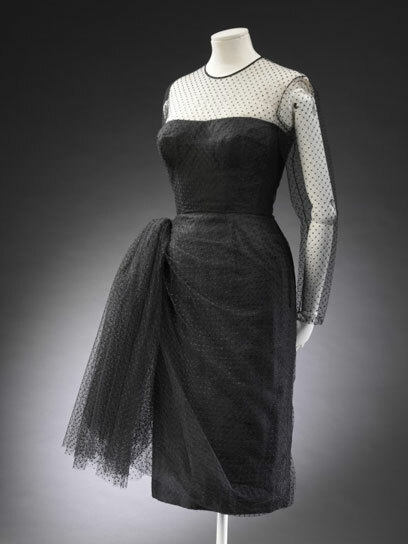 In his book 'The Little Dictionary of Fashion' (1954) Christian Dior (1905-57) described cocktail dresses as ‘elaborate and dressy afternoon frocks’, preferably in black taffeta, satin, chiffon and wool. These confections became the personification of the ‘little black dress’ and were often accessorised with gloves and small, elaborate hats. This dress was designed by Michael Sherard (1910–98) for his acclaimed 1958 spring collection. The flamenco dress was a recurring theme in 1950s cocktail and evening wear. Sherard’s version has a bell-like skirt and train made entirely of lace, his trademark fabric. 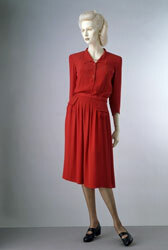 This is a good example of a sheath dress, popular throughout the 1950s. Its construction appears simple, but the clean lines are achieved by skilled cutting and intricate diagonal seaming. The grosgrain waist stay (grosgrain is a heavily ribbed silk) bears the label 'Jean Desses 17 Avenue Matignon PARIS'. Joan Regan was a popular singer with a particularly glamorous image. 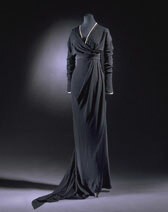 Here she is shown in a full-length, off the shoulder evening gown. The bodice is shaped, and is probably corseted. Her hair is set with curls around the face, and she wears bright red lipstick. 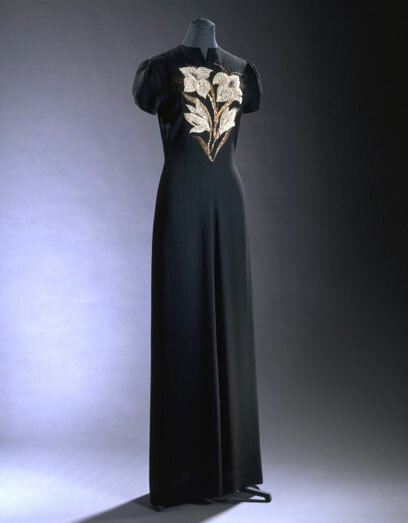 This dress was designed by the London couturier Victor Stiebel (1907–76). He was originally trained by the court dressmaker, Reville. Lady Ethel Templer (née Davie, 1904-97), bought this dress in the late 1950s. 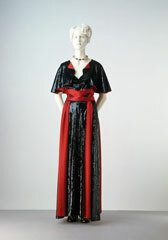 She was very slim and was able to buy the original dress worn by a house model for the collection. It was originally strapless, but she asked Stiebel to add the straps because her shoulders were narrow. Lady Templer was the wife of the British High Commissioner to Malaya, and required an extensive wardrobe for the many formal dinners and state functions that she had to attend. The embroidery upon the bodice would have originally been more silvery than it appears now. The metal has oxidised making it appear slightly black and dull. 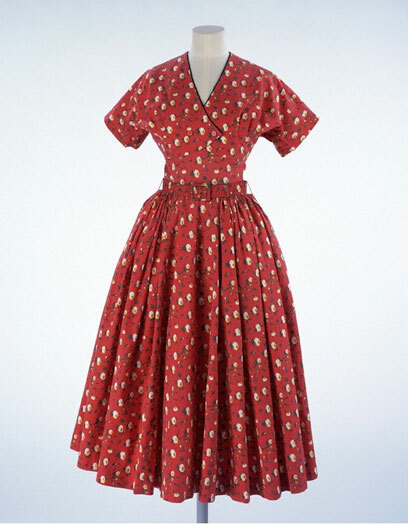 This dress is typical of the 1950s. 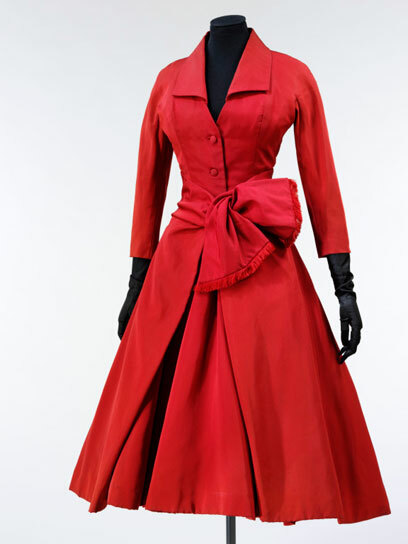 It reflects the fashionable 'New Look' style introduced by Christian Dior (1905-57) in 1947, with its voluminous mid-calf length skirt and tight moulded bodice. The skirt is supported by layers and layers of tulle. 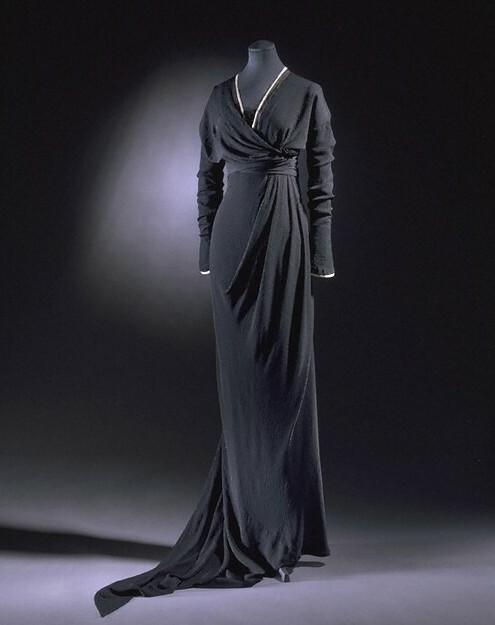 This dress was made by top London couturier Hardy Amies, but this silhouette permeated into most women's wardrobes via ready-to-wear or home pattern versions. Immediately after the Second World War when fabric was scarce, many women sewed extra strips of material onto the bottom of their existing skirts to achieve the fashionable length and fullness. The House of Heim was founded in 1898 to serve an aristocratic clientele. Jacques Heim (1899-1967) began to extend his parents' establishment, which specialized in furs, into a couture house in 1920. He launched 'Heim Jeunes Filles' in 1936 to follow younger tastes in fashion. All Heim's designs had a classical elegance that made them suitable for grand, formal occasions. His business closed in 1969. This long, sleeveless ballgown is made of fuschia silk organza. The full skirt features deep box pleats at the back for volume. 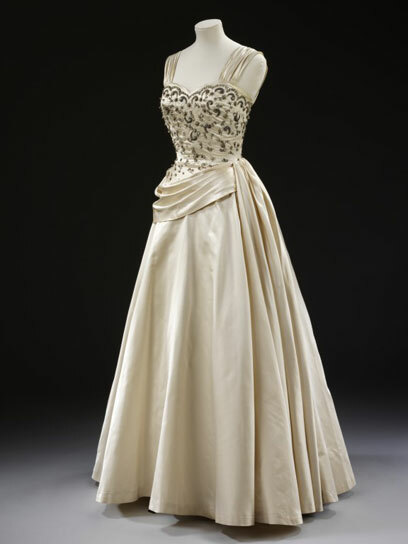 It is shorter at the front than at the back, combining the formal grandeur of traditional ballgowns and the fashion for short eveningwear typical of the late 1950s. Pierre Balmain (1914–82) opened his couture house in 1945. He had previously trained alongside Christian Dior at the couture house of Lucien Lelong. Balmain became one of the most successful couturiers of his generation and by 1956 his house employed 600 workers, with 12 couture workrooms and in-house fur and millinery ateliers. 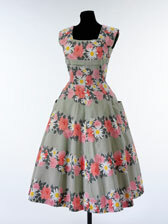 This youthful summer dress has a boned petticoat, with a full tulle skirt typical of the 1950s. 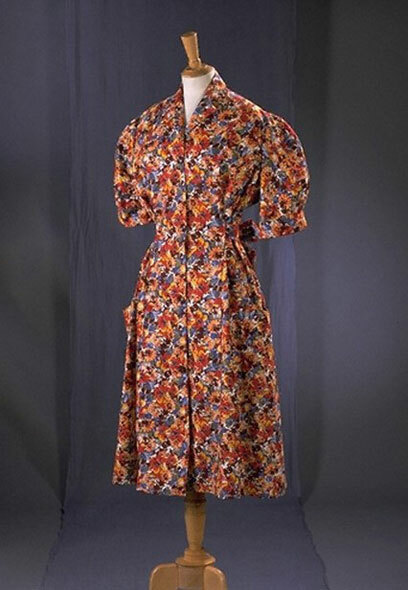 Horrockses’ cotton dresses, with their brightly coloured prints and full gathered skirts, were a fashion success story in the period after the Second World War. Horrockses was a large cotton manufacturing firm, founded in Preston, Lancashire, in 1791, known for weaving high quality household cottons. In 1946 they launched Horrockses Fashions Limited, a subsidiary company making ready-to-wear dresses, housecoats and beachwear, with headquarters in London's Hanover Square. The success of the firm was due to the quality of the design of the printed cottons, often commissioned from artists, combined with advanced production methods, which preserved the crispness of the cotton while allowing for frequent washing. Young people's income was at its highest since the end of the Second World War, creating the desire for a wardrobe which did more than simply copy adult dress. 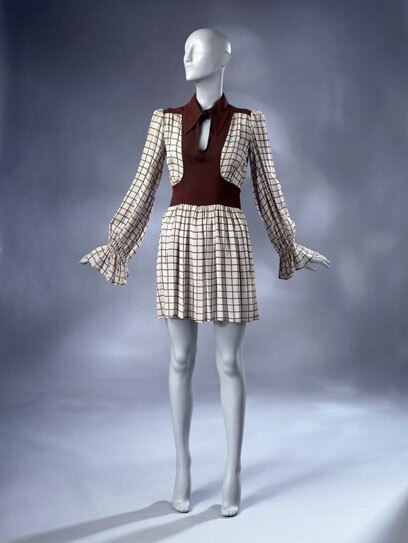 Designers like Mary Quant and Biba label provided clothes that were aimed specifically at young people, of which the mini-skirt was the most distinctive introduction. Women wore pale foundation and emphasised their eyes with kohl, mascara and false eyelashes. Hair was long and straight or worn in a shaped bob or wedge. Towards the end of the decade the hippy movement from the west coast of America emerged, experimenting with colours, patterns and textures borrowed from non-Western cultures. 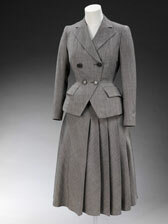 Older or more conservative women still tended to dress in skirts below the knee with tailored jackets, coats or cardigans. 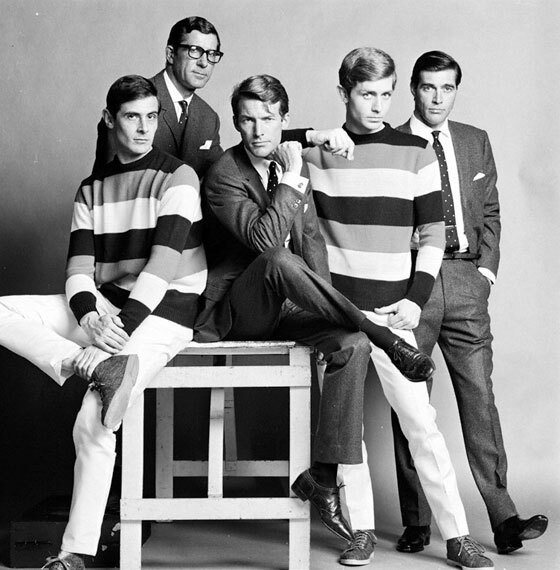 Perhaps the most remarkable development in 1960s dress was the dramatic change in menswear. 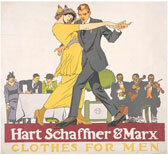 For the past 150 years, clothing for men had been tailor-made, and plain and sombre in appearance. Now, colourful new elements were introduced, such as the collarless jacket, worn with slim-fitting trousers and boots. During the mid-1960s frills and cravats were worn with vividly printed shirts. Finally, lapels and trousers took on exaggeratedly wide dimensions. Clothing became increasingly unisex as men and women shopped at the same boutiques for similar items. This photograph is by fashion photographer John French. Throughout the 1950s and 1960s he shot the latest fashions for magazines and newspapers, and he usually photographed affordable, high-street ranges that many teenagers would be able to buy. The models shown here sport typical 1960s styling. The men have exaggerated side partings and side-burns, whilst the woman has a heavy, straight fringe. She is wearing a fashionable tunic top and knickerbockers. The models shown here are easily dated to the 1960s because of their hair and make up. They sport heavy fringes with straight hair curled up at the bottom. Their lipstick is pale but their eyes are accentuated with thick, black kohl eyeliner. Barbara Hulanicki and her husband John Fitz Simon set up Biba in 1963 as a mail order boutique. The success of their affordable, youthful designs enabled them to open a small shop in Kensington the following year. They attracted glamorous pop stars, bohemian aristocrats and impoverished students alike. In April 1966, the American news magazine 'Time' published a special edition celebrating ‘London: The Swinging City’. It named Biba as ‘the most in shop for gear’. Barbara Hulanicki launched the Biba label with her husband John Fitz Simon in 1963, initially selling clothes by mail order through newspaper advertisements. The success of her affordable, fashionable designs enabled them to open a series of shops in Kensington, London. This dress appeared in the Summer 1969 mail order catalogue. Marion Kite, an art school student, wore the dress for special occasions in London, and also on holiday in Cornwall. 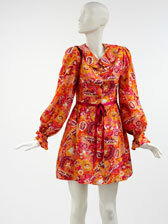 Mini-dresses were popular with Biba customers in the late 1960s, alongside longer dresses and trousers with wide flares. Holiday dresses such as this were even shorter than the standard Biba dress length. This photograph, featuring Cilla Black, Lulu, Marianne Faithfull, Julie Grant, the Vernon sisters and others, was taken by fashion photographer John French. Throughout the 1950s and 1960s he shot the latest fashions for magazines and newspapers, and he usually photographed affordable, high-street ranges that many teenagers would be able to buy. The celebrities shown here are easily dated to the 1960s because of their hair and make up. They sport bouffant styles, back-combed for a full, bee-hive shape, and heavy fringes. Their lipstick is pale but their eyes are accentuated with thick, black kohl eyeliner. This evening mini-dress in black crepe was designed by Mary Quant for her Ginger Group collections in 1967-1968. Mary Quant was world-famous for championing the mini-skirt, and in the 1960s her name became associated with the predominantly black Chelsea look, with its beatnik overtones. 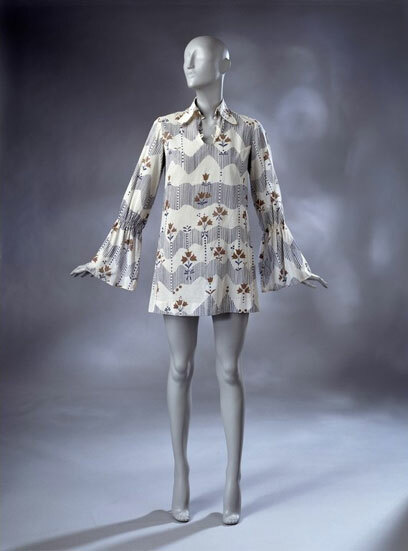 This tunic was part of Ossie Clark's first collection for his lower-priced Radley label. The print is by Celia Birtwell. The simple silhouette meant that it could be worn either as a dress or with trousers. Kay, Ossie Clark's sister, wore it as a mini-dress when Clark married Celia Birtwell in 1968. Ossie Clark was one of Britain's most influential fashion designers of the 1960s and 1970s. This photograph is by fashion photographer John French. Throughout the 1950s and 1960s he shot the latest fashions for magazines and newspapers, and he usually photographed affordable, high-street ranges that most people would be able to buy. 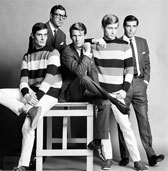 The models shown here sport work and casual wear, and are easily dated to the 1960s because of their hair, which is parted at one side. One of the earliest works by Mary Quant in the V&A's collection, this shift illustrates how she broke with convention and made clothes specifically for young customers. Its donor identified the work ('my scarlet runner') as 'a seminal dress at the beginning of a new and still, to me, exciting decade'. Until the beginning of the 1960s youth quake, daughters had no alternative but to dress like their mothers. 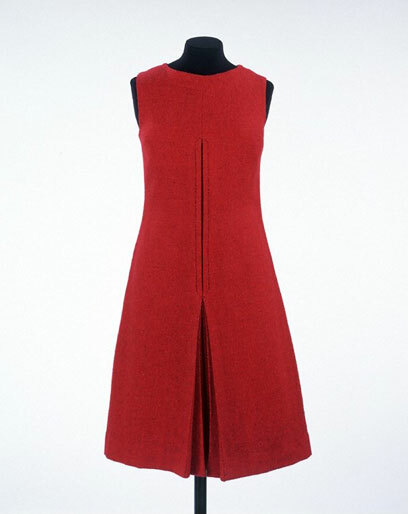 In tune with the times, Mary Quant offered them identities of their own with styles such as this vivid red shift with youthful appeal. The late 1960s celebrity boutique phenomenon saw popular teenage idols launching clothing lines and boutiques. These included singer Sandie Shaw, TV presenter Cathy McGowan, and even the footballer George Best. Such ventures tended to be short-lived, lasting a few years or even months, like the Beatles' 'Apple' boutique, which closed in July 1968 after 7 months. The famous 1960s model, Twiggy, launched her fashion label 'Twiggy Dresses' on 16 February 1967. Each garment, costing between £6 and £13, came with a free Twiggy portrait hanger. The shops showed them on Twiggy portrait mannequins, and Twiggy did all the modelling and publicity. She worked with the young designers, Paul Babb and Pamela Proctor to ensure they designed clothes she would happily wear herself, such as this brightly patterned mini-dress. This personal input and strong branding enabled the label to run successfully for three years. Cardin's bold futuristic clothes were largely designed for active young women. In 1966 The Observer newspaper said of Cardin's designs: 'His contribution to modern living may be practical but it's rather a shock.' From the mid 1960s until about 1971 Cardin favoured heavyweight woollen jerseys for his avant-garde designs. This fabric allowed free movement, but at the same time was sufficiently rigid to maintain the clear-cut shapes. This 'space suit' forms part of the Cecil Beaton Collection. With great energy and determination Sir Cecil Beaton (1904-1980) contacted designers and the well-dressed elite of Europe and America to create this lasting monument to the art of dress. The collection was exhibited in 1971, accompanied by a catalogue that detailed its enormous range. In 1966 the Draper's Record announced that Ossie Clark had launched Britain's first range of throwaway dresses. The floral design, by Celia Birtwell, was printed onto imitation paper made by Johnson and Johnson, formed from bonded textile fibres. The wholesale price was 15 shillings. 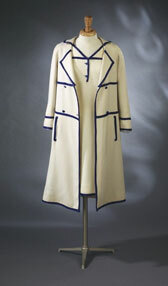 Midi-coats and maxi-coats for men and women were introduced in 1966. High-waisted with broad lapels and sometimes belts, they reached to the mid-calf for the midi and to the ankles for the maxi. The style was derived from military coats at a time when military tailoring had become fashionable. During the late 1960s there was a craze for wearing second-hand uniforms, usually Brigade of Guards red jackets and various greatcoats. It was these greatcoats that influenced the cut of the midi and maxi. This particular example was worn by Sir Roy Strong, a former Director of the Museum. Mary Quant's mini-dresses for her 'Ginger Group' label epitomise the 1960s fashion revolution. 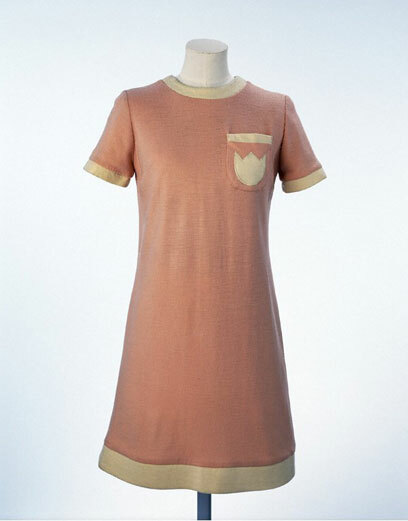 This jersey shift dress is like a sweater grown to dress length, and a version was modelled by Twiggy in a Vogue 'Young Idea' fashion spread in April 1966. With the hem well above the knee it was ideally suited to her boyish figure. The dress was donated as unsold stock from a smart boutique called 'Merlyn', in London's East End, reputedly patronised by gangsters and their girlfriends. 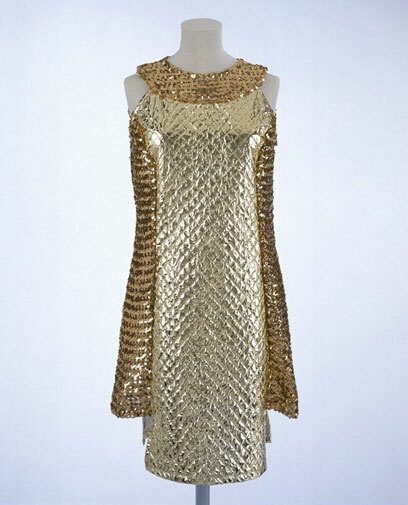 Paco Rabanne led the field of radical experimentation in elite fashion design in the 1960s. Having trained as an architect, initially he made plastic buttons and jewellery for Paris couture houses. When he opened his own fashion business in 1966, his architectural background and the current interest in space travel informed his work. Using techniques borrowed from jewellery, he created sculptural dresses in unconventional materials which broke all the rules. 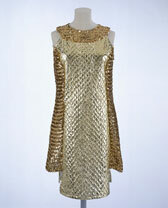 This 'chain mail' dress was worn over a flesh-coloured bodystocking. Baroness Helen Bachofen von Echt wore it to a party in New York where she danced with Frank Sinatra. Dispo's paper dresses were actually made out of a bonded cellulose fibre and could be washed. A Which magazine consumer trial found that they could be worn at least six times, while other brands would not survive beyond two or three. 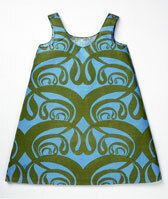 This printed design was based on an Art Nouveau textile in the V&A collections. A fashionable young woman would have worn this garment either as a mini-dress or with trousers. The textile design is a plain grid pattern. A simple waist-tie gives shapely definition to the loose tunic-style. This was one of the first Ossie Clark designs for his less expensive Radley label. Clark was one of Britain's most influential fashion designers of the 1960s and 70s. The thigh-high ‘mini’ was symbolic of the 1960s in both Britain and America. Though initially shocking to some, many designers embraced its informality and ease of movement. Here American designer Leonard Joseph combines the youthful shape of the mini with an unconventional paper textile. Designed for the avant-garde New York boutique 'Forward Look', this dress was worn by Princess Stanislaus Radziwill. She was the sister of Jackie Kennedy and a regular figure on the social scene of both sides of the Atlantic. This daywear ensemble, designed by Emanuel Ungaro (1933–), is composed of a knee-length dress and a pair of shorts. 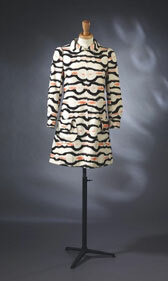 Made from printed gabardine, showing abstract motifs in orange, white and brown, the dress has a small round collar and long sleeves. The matching shorts are worn under the dress and are not visible. Born in France to Italian parents. Ungaro trained as a tailor, and then worked for Balenciaga and Courreges, whose influence is particularly evident here, and who was the first designer to introduce this concept in the mid-1960s. Ungaro’s interpretation manifests itself through bold prints, which became the designer’s hallmark. Emmanuel Ungaro was born in Aix-en-Provence, France, in 1933. He played an important role in the rejuvenation of Paris fashion. He left Balenciaga, with whom he had worked for six years, to join Courrèges in 1964. 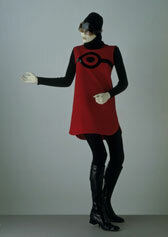 When this partnership failed, he began to design, independently showing his first collection in 1965. 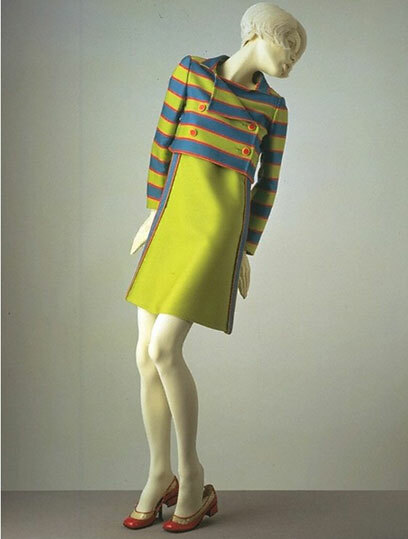 Like Courrèges, Ungaro sculpted hard-edged clothes in heavy worsted fabrics and triple gaberdines. 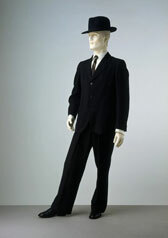 His garments retained the angular shapes of the mid 1960s fashions so perfectly that they often almost stood up by themselves. 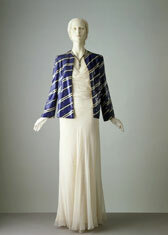 This day dress and jacket was worn by Mrs Brenda Azario. It was featured in French Vogue (March 1966 and March 1967). This Moss Bros suit, designed in 1969, is striking in that it is totally unadorned, even the jacket buttons are concealed by a fly front. The stand-up Nehru style collar became fashionable in the mid 1960s. A daring purple satin lining belies the sober grey exterior. Moss Bros was founded in the 1850s by Moses Moses. The company built its reputation from selling ready-to-wear tailoring. 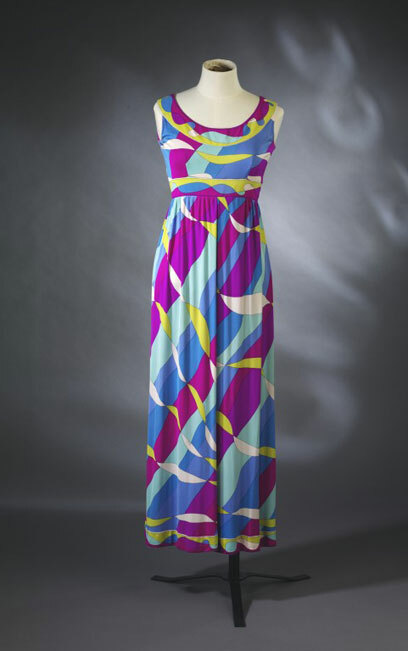 This trouser-dress designed by Emilio Pucci in 1968 is typical of Italian fashion.Cut in a luxurious Italian-produced silk jersey, it displays the bright Mediterranean colours which have been Pucci’s hallmark since the beginning of his career in the mid-1950s. The dress has a sleeveless bodice with a low-cut neckline. The bodice is cut under the bust and continues into a wide trouser-skirt. Fashion at the end of the 1960s was characterised by the abandonment of short and rigid A-line mini-dresses in favour of long and svelte lines, and by the increasing presence of trousers in women’s wardrobes. 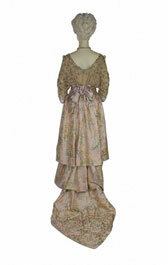 Long dresses and skirts were no longer restricted to evening wear but were increasingly part of daywear. 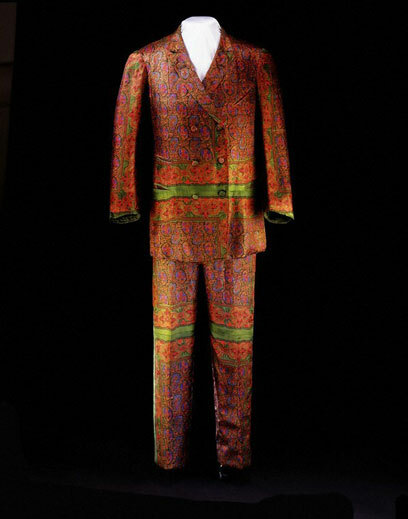 This suit was made by Bernard Weatherill during the British fashion boom of the 1960s and is a good example of the styles of that period. The repetition of curved lines in flapped pockets, cuffs, collar and lapels, along with unusual covered buttons, show a dapper and stylish attention to detail. 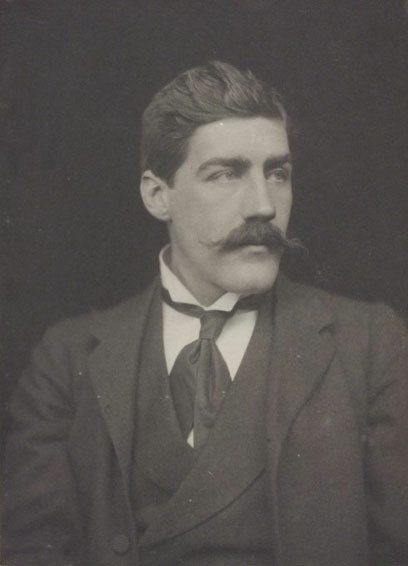 Bernard Weatherill was a men's tailoring and equestrian dress-maker, established in Savile Row in 1912. Today, the company retains a host of Royal Appointments. 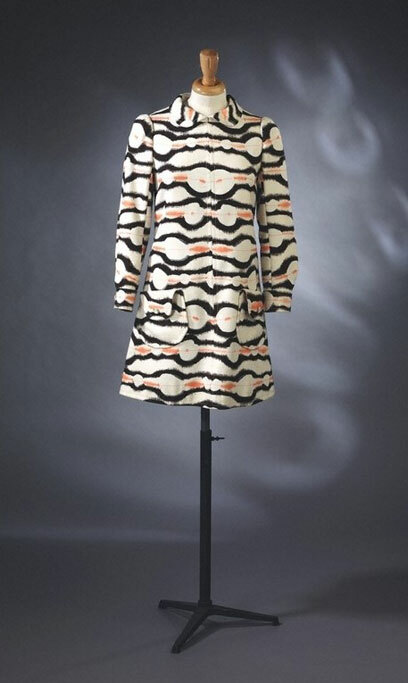 This ensemble consisting of a coat and a dress, was designed by André Courrèges in 1965. The coat is short, double breasted, and has a triangular shape. It has two long sleeves, two vertical pockets on the front and fastens with four buttons. There is a blue spandex trimming around the collar, the upper part of the coat, the pockets and the sleeves. The back of the coat shows a slit from waist down to the hem, covered with a panel. All the seams are double.The dress is short, and has a triangular shape. It is sleeveless. There are two buttons on the front, six at the back and two vertical pockets on the front. There is a blue spandex trimming around the neckline, the shoulders, the pockets and the hem. André Courreges was born in France in 1923. After a brief career in engineering, he turned to fashion and worked with Balenciaga from 1949 to 1961. From Balenciaga he learned to search for a pure, simple and sharp line which, mixed with his taste for white and pure colours, allowed him to create designs for a younger generation. This ensemble shows Courrège's architectural approach to fashion: the use of geometrical shapes, minimalist details and colour. The use of white, underlined here with plastic blue, and the use of heavy worsted, make the shape of this ensemble stand out almost as an architectural object. The choice of blue and white, refers to the 'matelot' style popular amongst youth in France during the mid 1960s.